Happy Birthday to our sweet girl, love you so much! You bring happiness wherever you go. Congratulations to our Lily on Her AKC Championship. 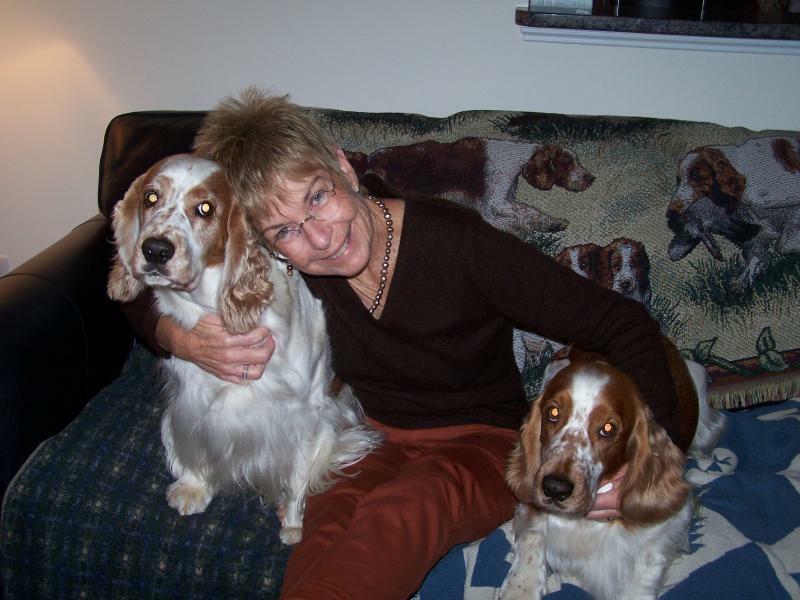 What a wonderful time we had at the Troy Kennel Club dog show on Saturday April 6, 2013, where Lily finished her AKC championship with her second 5 Point Major!! We are so proud of our girl, she looked wondeful in the ring. Now she will be starting to work on her AKC tracking title in 2 weeks. 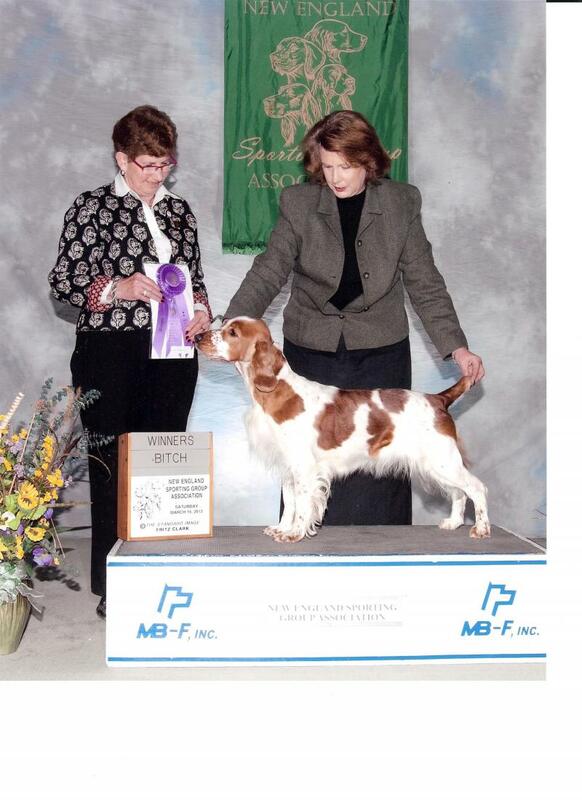 We are so proud of our Lily Lexi's Grace Liberty Bell, who won a 5 point major at a supported entry of welsh springers at the New England Sporting Group Assoc. show on March 16th in West Springfield, MA. 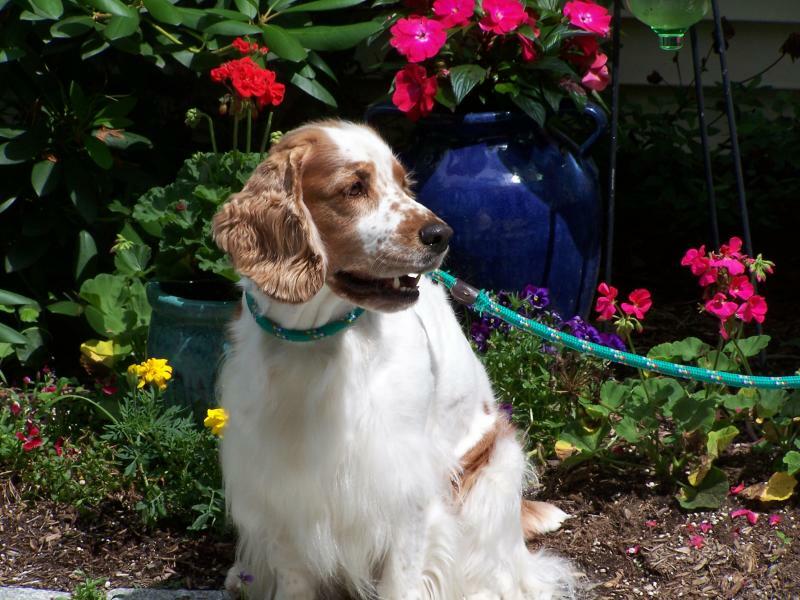 Lily was handled by Candy Carswell who did an excellent job and who Lily loves to be with. Thank you Candy! Thanks to Cody's family (Lexi's Grace Walking Liberty) for sending us a picture of how beautiful Cody looks at 3 years old. 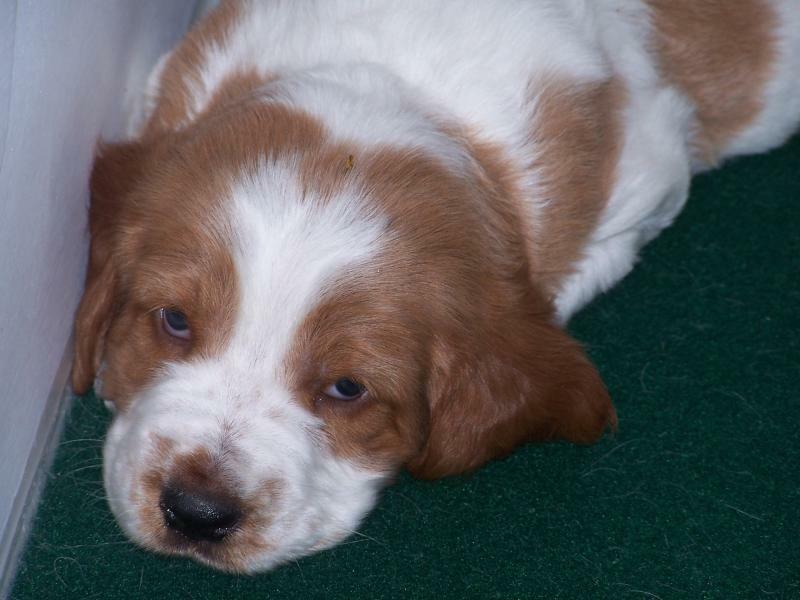 He was a wonderful puppy and we so enjoyed raising him for the first 9 weeks of his life. Thank you for the continued updates. I love this picture, he looks so much like his mother Lexi. 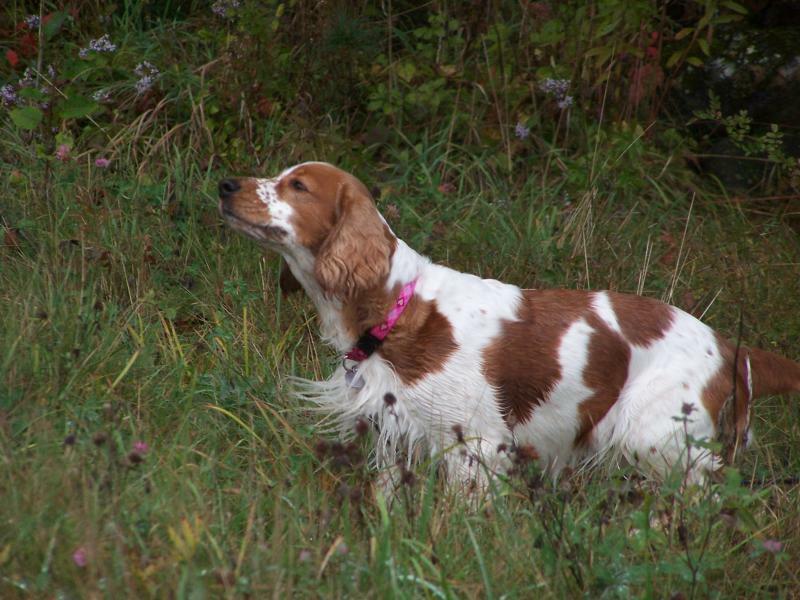 Lily (Lexi's Grace Liberty Bell) won a 5 point major today at the New England Sporting Dog Show. We are so proud of our girl, she looked wonderful! Hard to believe you are 3 years old today. And a special wish for our Lily, we love you so much. 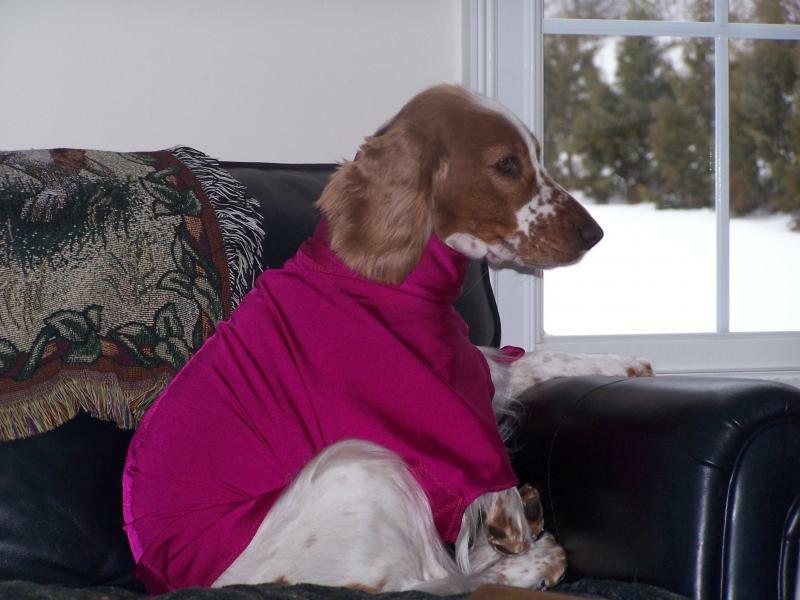 Lily is getting ready for shows this weekend so after her bath and blow dry she relaxes on the couch. We just love the way she sits in her show robe, could anything be cuter! 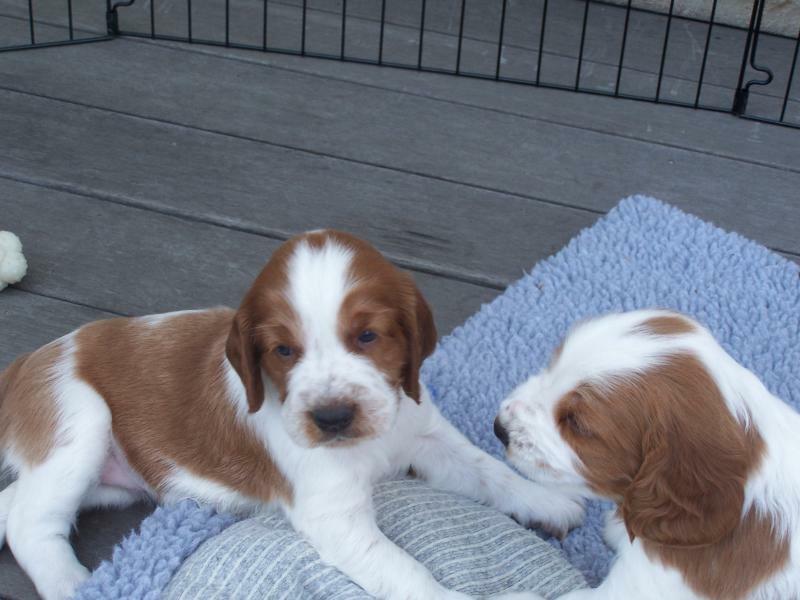 Our Lexi x Starbuck litter has arrived and they are beautiful. 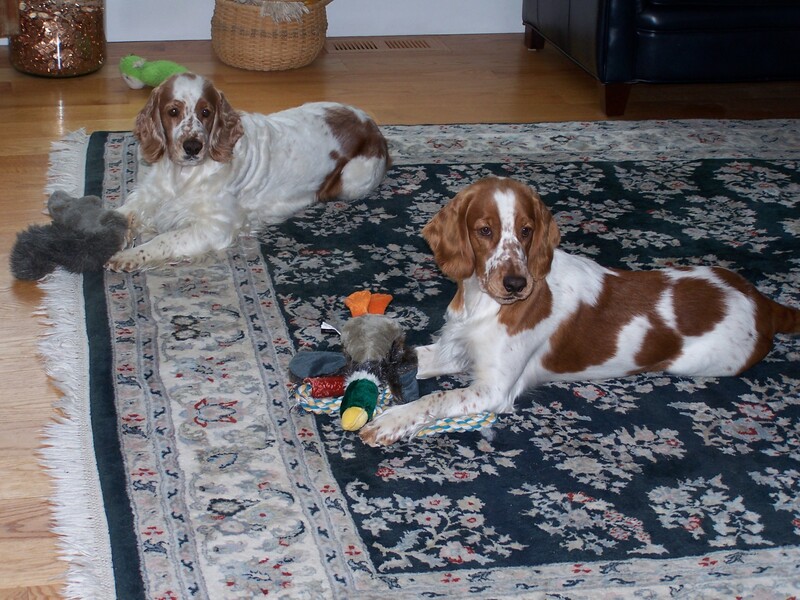 Lexi and Lily are so happy to see our friends from Nantucket who came to visit. 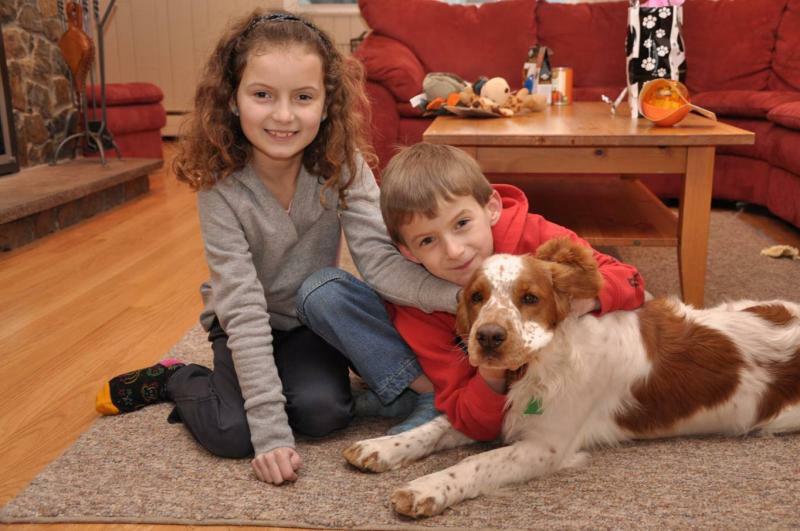 The last time they saw Lily she was only 9 weeks old. 2 more people to follow around the house. Such lucky girls to be so loved. Cody, Lexi's Grace Walking Liberty, is happy October has arrived and the beaches are now open to dogs. 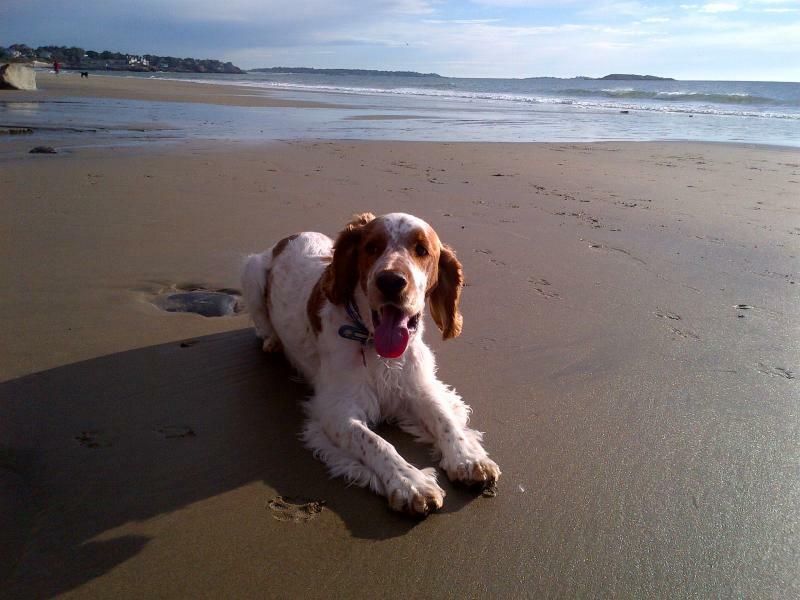 His family lives close to the ocean so he is lucky to be able to be on the beach often. 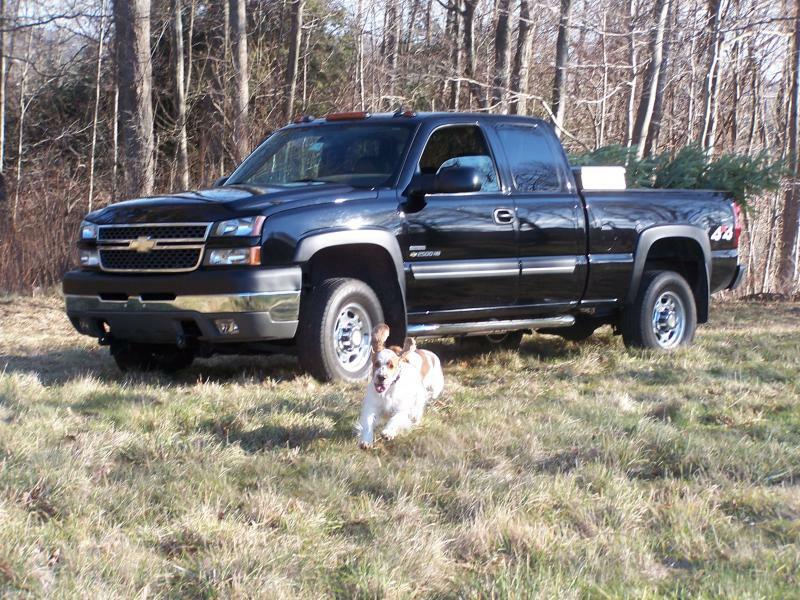 Thanks to his owners for sharing this picture with us. Cody looks so happy! Even though it rained last night, we took a walk in the fields today. The grass was tall and wet and the temperature was cool but the trees were beautiful. 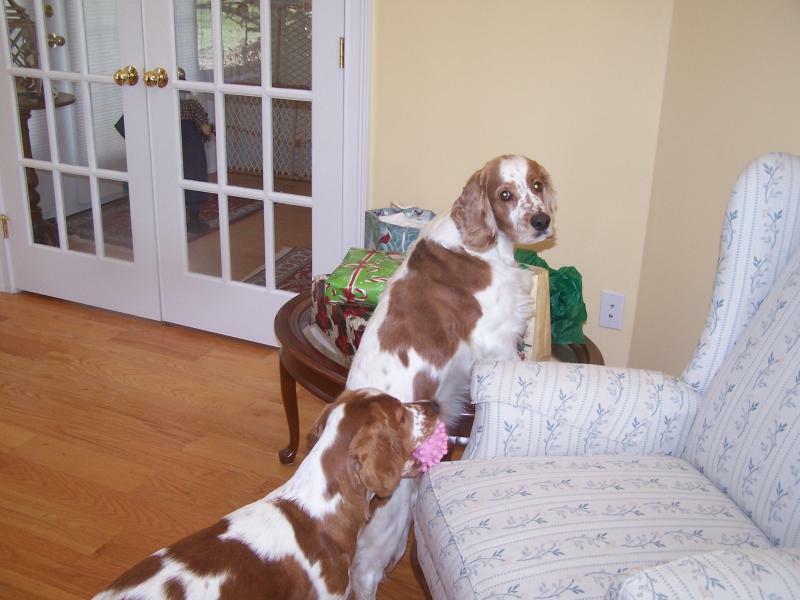 Lexi and Lily had a wonderful time and were very good about staying with us and coming back for treats when called. Here are a few shots of our day. 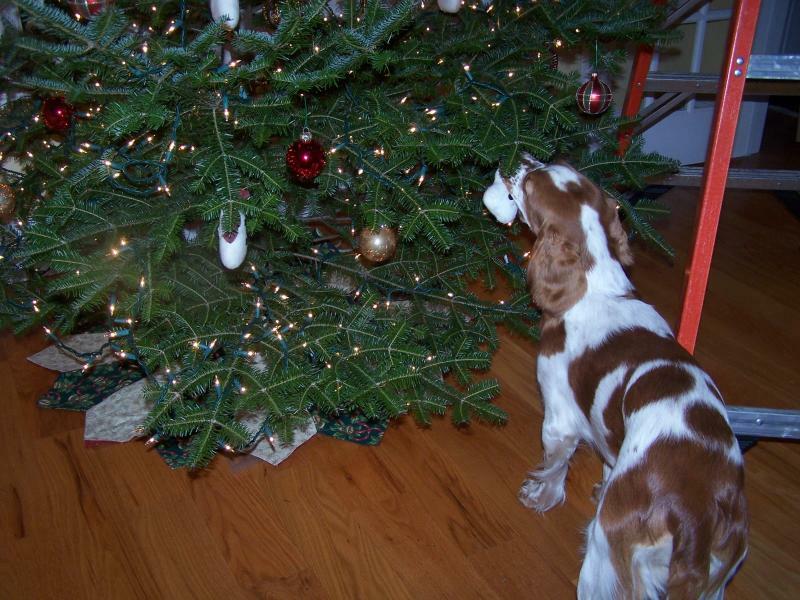 Something smells interesting to Lily. Lily ran to the top of a 10' mound of soil and was quite proud of herself. Now we have a wet, muddy welshie, but she is having fun! What is on the other side of the stonewall Lily? Lexi enjoying time in the grasses so much to smell and so exciting to run free. Lexi coming when called, such a good girl. The girls each received dehydrated sweet potato chips when then came to me, which I make for them and they love! Sorry I cut off your ears Lexi. Beautiful day for a walk in New England! 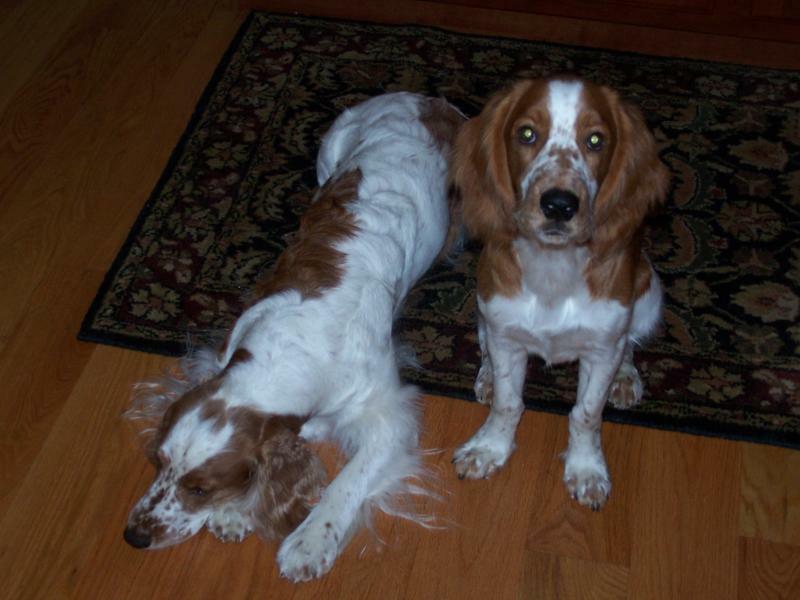 We really enjoy seeing our puppies as they grow up and appreciate families sending us pictures. 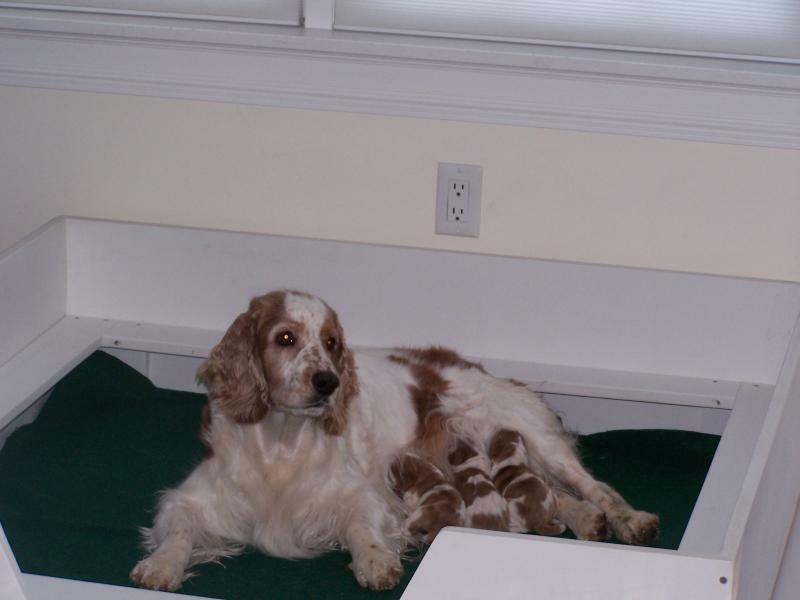 This week we received great pictures of Holly, Lexi's Grace Lady Liberty, with her family. We know you love her so much! Holly loves being one of the girls and playing dressup! 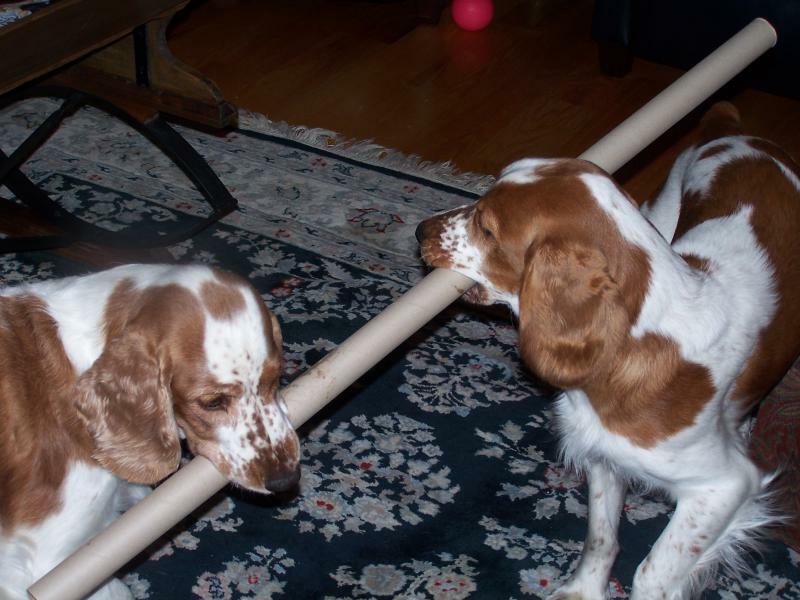 Lily and Lexi would love to play too. Every night Lily and I go for a walk while Russ and Lexi go on theirs. When Lily and I return she runs into the garden to check what types of creatures have been in her yard while she wasn't watching. Then she lays down while I weed. A nice time for both of us! 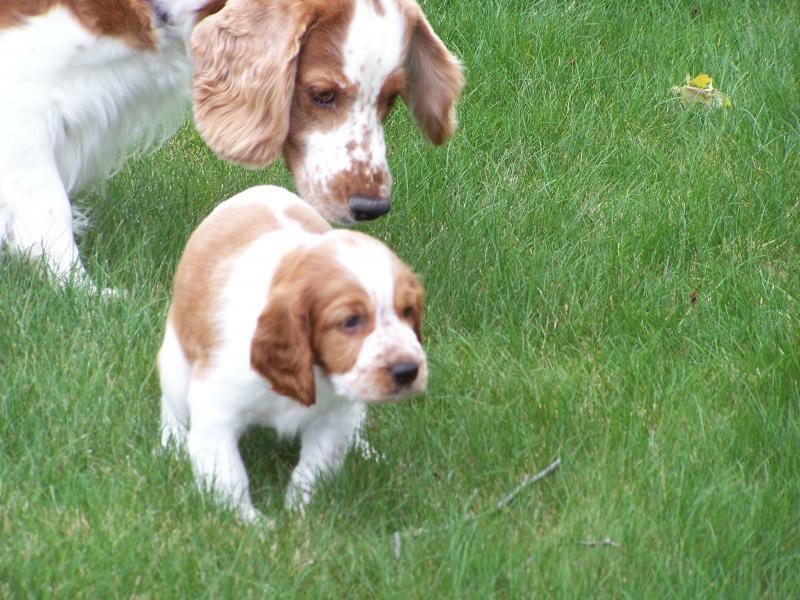 It is so nice to watch our puppies grow up and see the wonderful lives they have. Cody went on vacation with his family and did some hiking. He even carried his own water! What a beautiful boy he is. Lily is having lots of fun at the Fourth of July Cluster of shows in West Springfield, MA. On Wednesday 7-4-12, she went WB and BOS and on Thursday 7-5-12 she also went WB and BOS. She now has 10 points towards her championship! We are so proud of our sweet girl. Thanks Thanks to Ron Paice for this nice shot of Lily in the ring. We celebrated our Lily's birthday (Lily is the pup on the far right) a few days early. 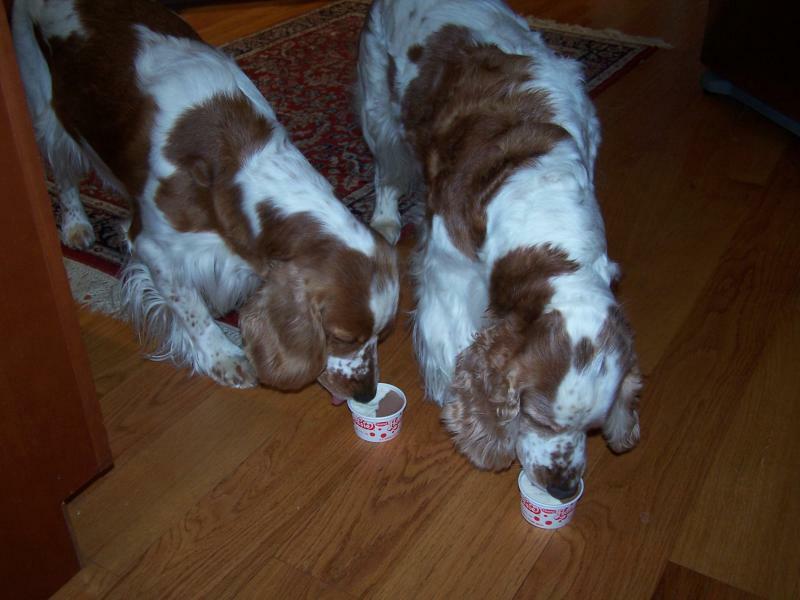 Her special treat, which she shared with her Mom Lexi was an ice cream cup. As you can see from the picture they enjoyed them. 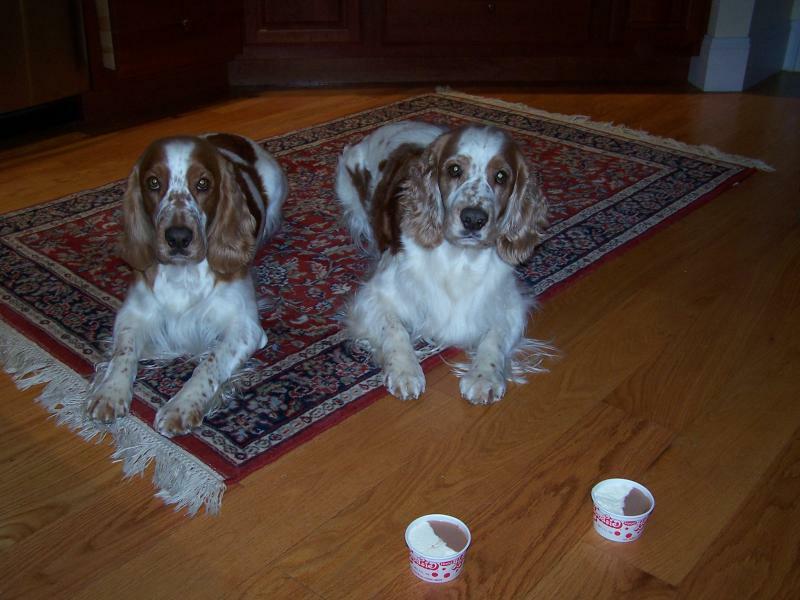 Such good girls when the ice cream is soooo close! Today was a snowy day and the girls loved being outside. 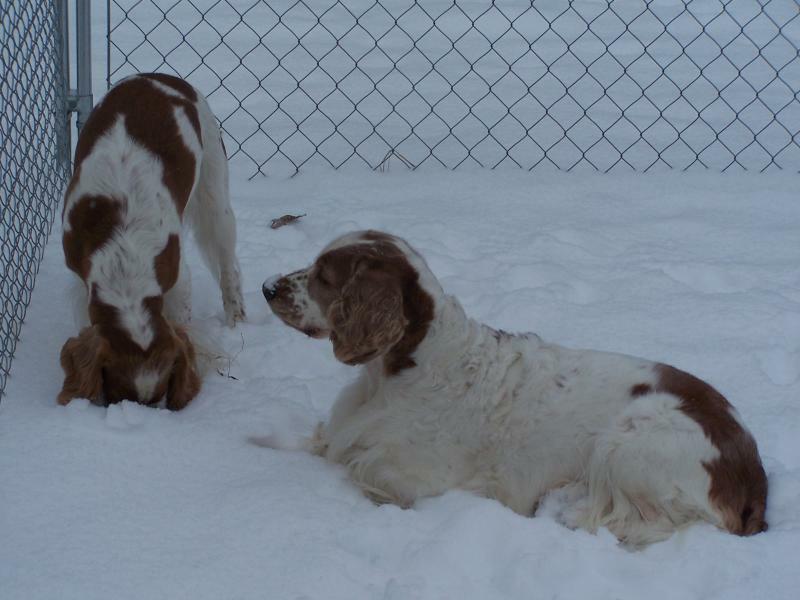 After taking a long walk with them, I put the girls in their pen and I shoveled the walk. As you can see the cold didn't bother them at all. Lily with her nose in the snow and if you look at the tip of Lexi's nose you will see she was doing the same. They like the snow better than I do. 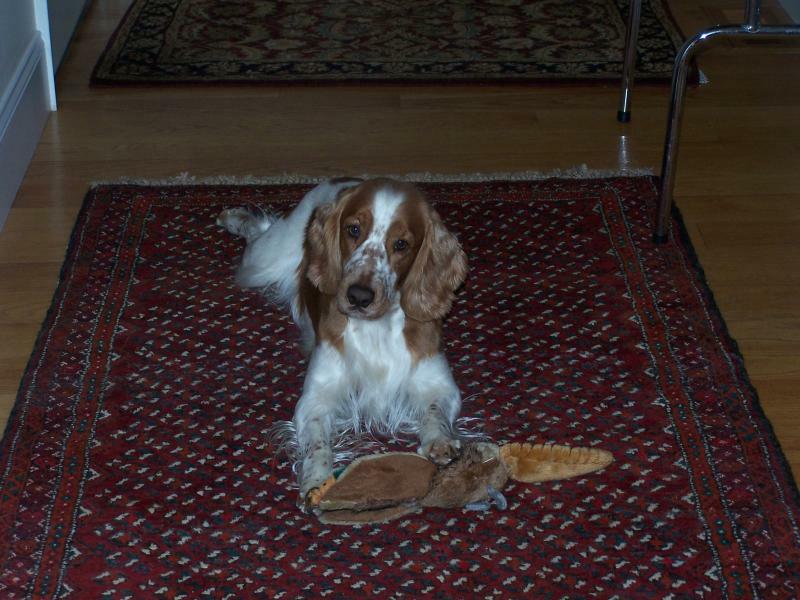 Then we came inside and Lily ran to get her stuffed pheasant to play with. Such happy girls...we are so lucky to share our lives with them! 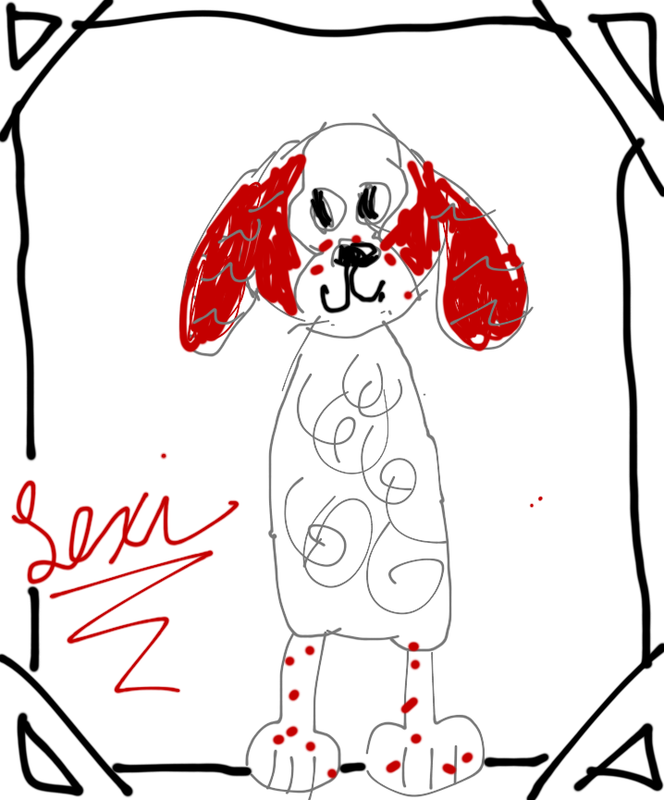 What a nice surprise we received tonight from our friend Marissa who drew this wonderful picture of Lexi on her I Pad. 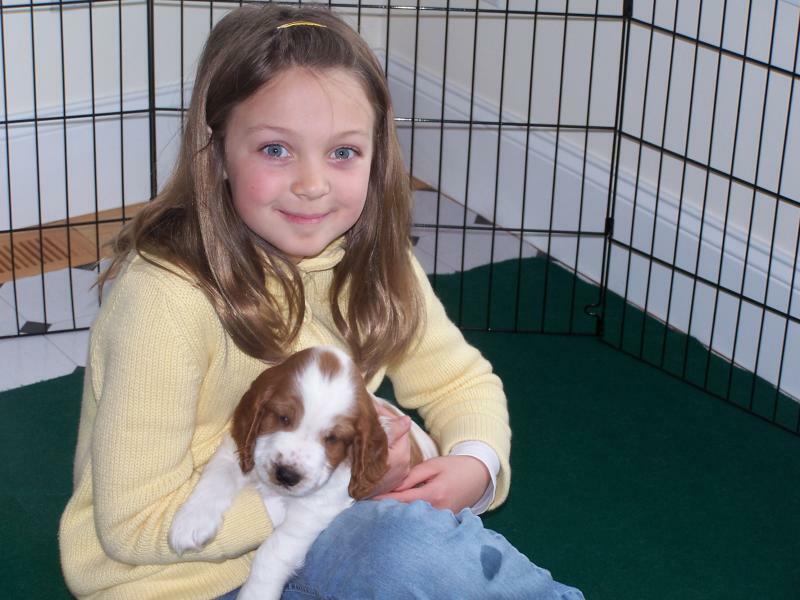 Marissa has one of Lexi's puppies in her family. Thank you so much. 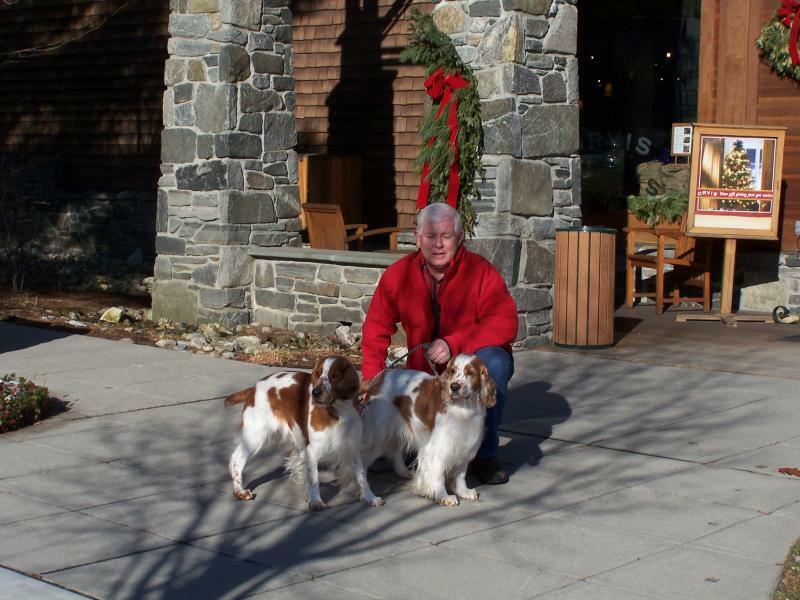 Russ and I took the girls with us Christmas shopping to Orvis in Manchester, Vermont. The nice thing about Orvis is that they encourage dogs to come into the store. 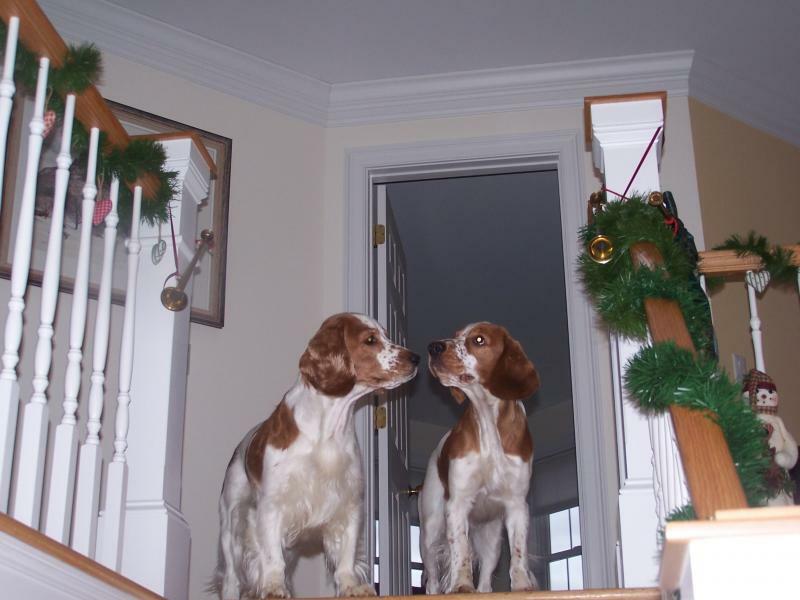 Many people introduced themselves to Lexi and Lily, who luckily were on their best behavior. What could be better for them than to be able to "meet and greet" which just happens to be one of their favorite activities. Russ and I were actually able to get some shopping done, even something for the girls to find under the tree. Lexi and Lily recently had their CERF eye exams and we are pleased to report that both mother and daughter tested normal. Very good news! 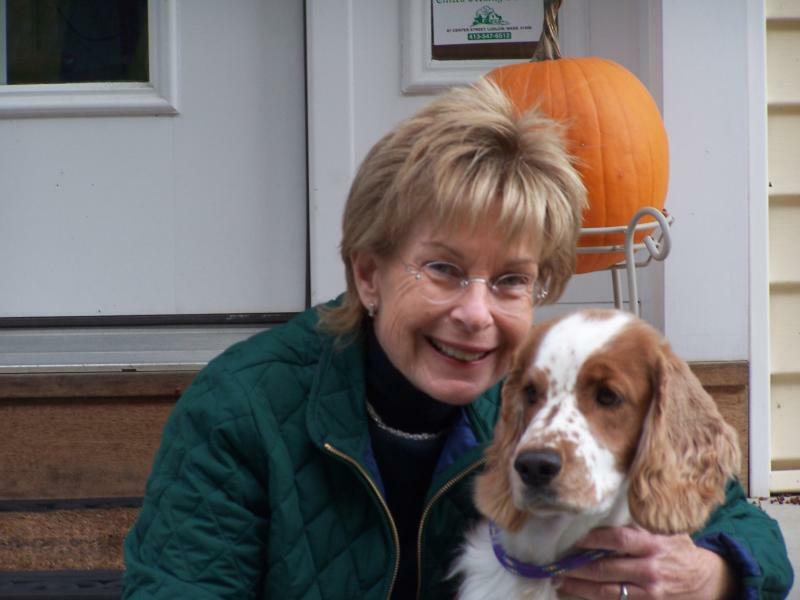 This fall Lexi and Marcia are enjoying a new activity which is tracking. 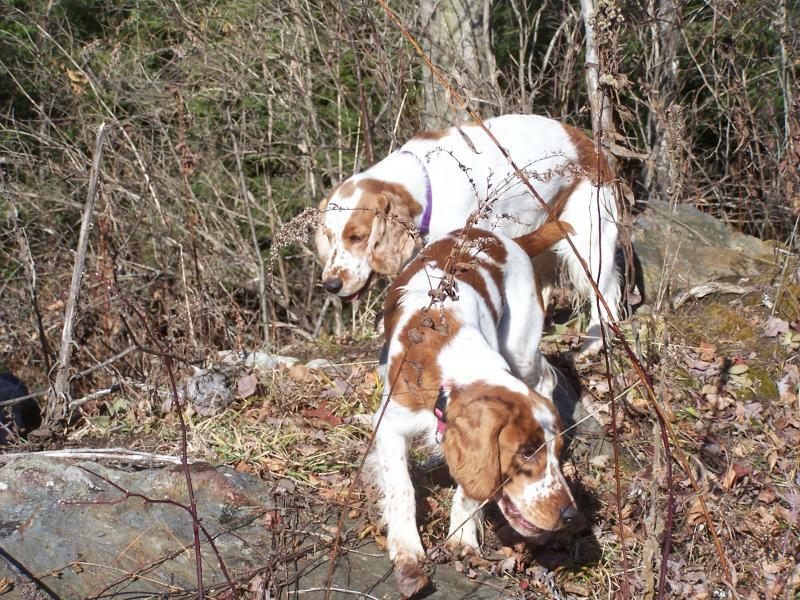 What is different about tracking as opposed to being in the show ring for both of us is that Lexi takes the lead in the field and I follow behind her as she follows the scent. It is very difficult not to give her any clues or move my hands. 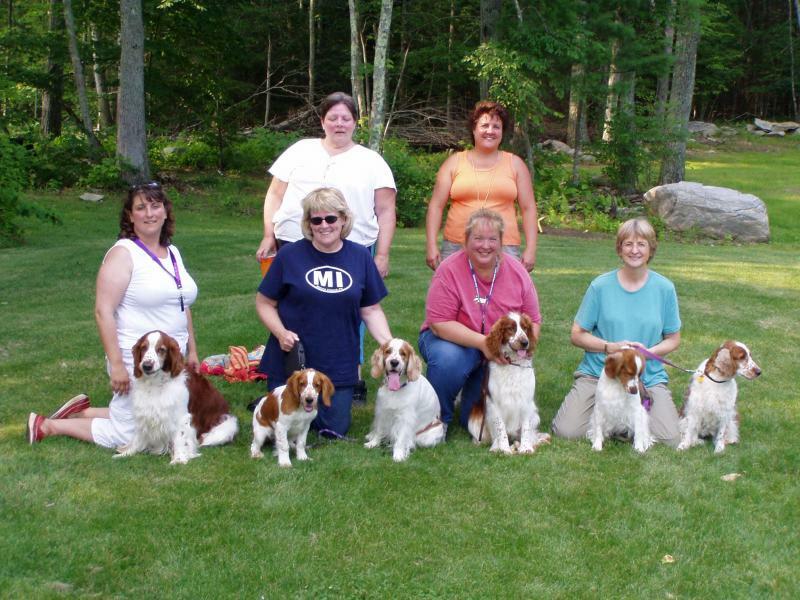 We will be going out again this weekend with our kennel club group to have fun and continue our education. 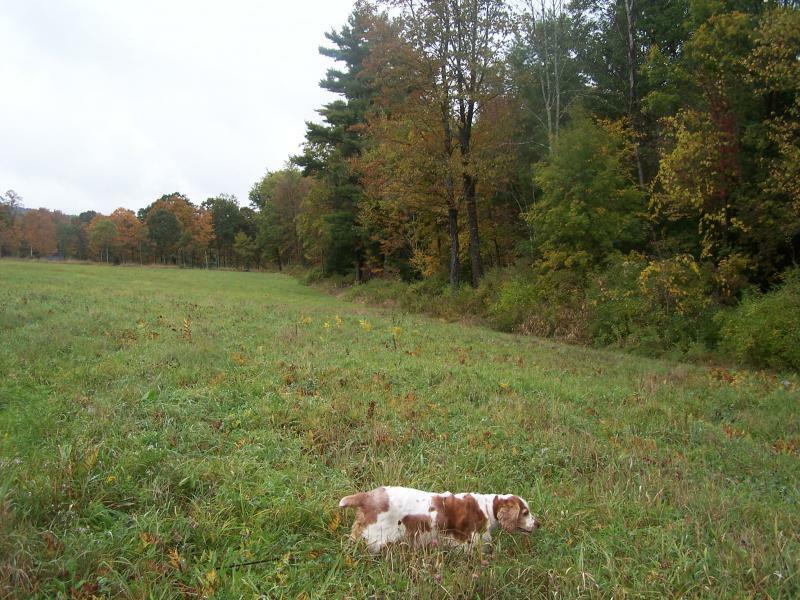 Lexi absolutely loves tracking and is so excited when it is her turn. 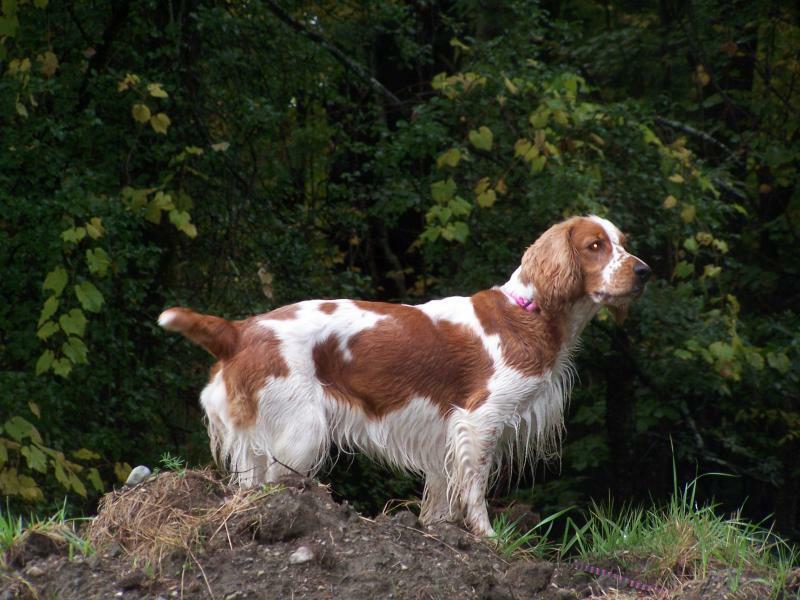 We are working toward her TD (tracking dog) title. I will take pictures this weekend to share. Lily is continuing to enjoy her time in the conformation show ring. Lily now has 7 points towards her championship title. We have shows planned in West Springfield for Thanksgiving weekend. If anyone is able to attend, please come to our setup to visit. We just receivedthese pictures of Holly, Lexi's Grace Lady Liberty, enjoying time in the water in New York with her family. 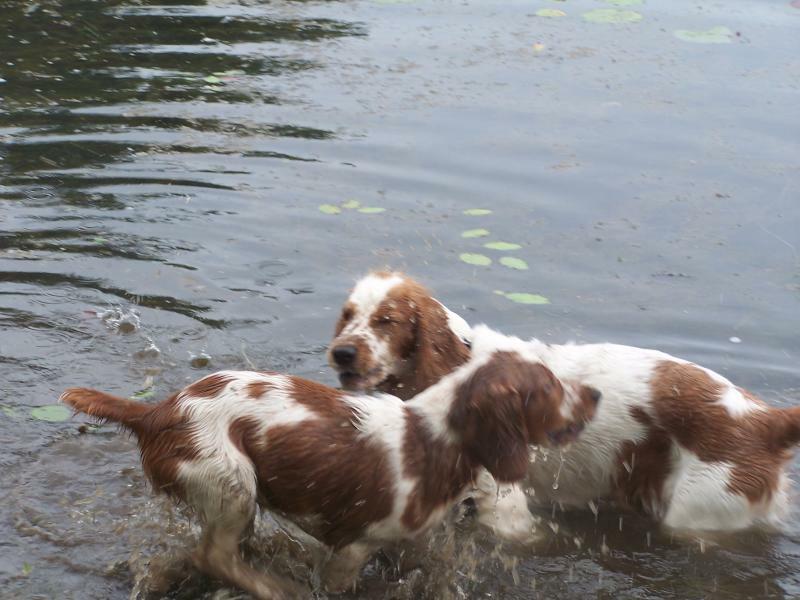 Looks like fun, Lexi and Lily would love to be there too. 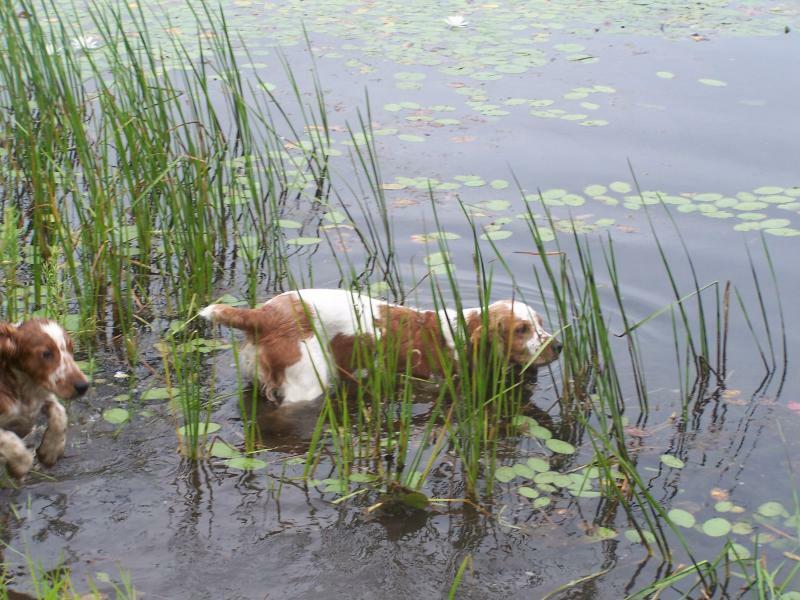 What a great picture we received yesterday of Cody, Lexi's Grace Walking Liberty,in the marshes watching the swans. What a lucky boy he is to be able to take walks with his family off lead. I would love to know what Cody is thinking. Cody is his mother's son. 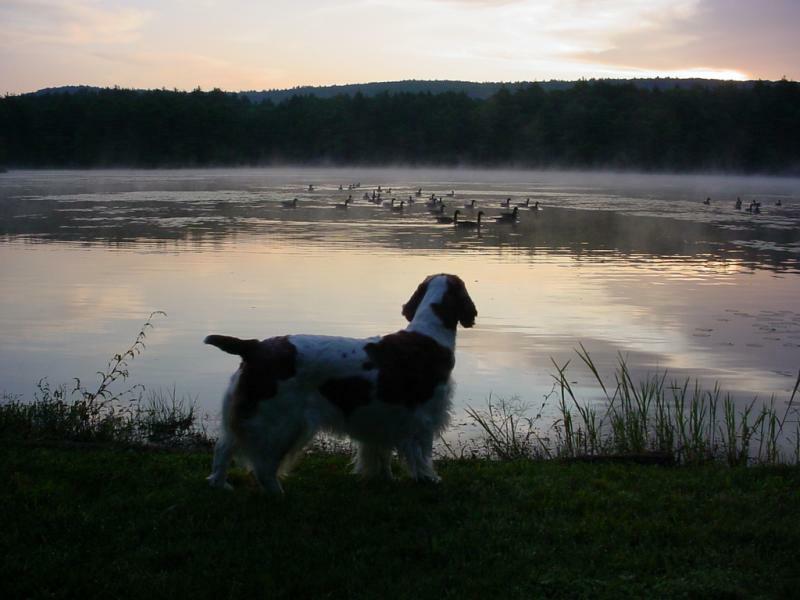 Here is his mother Lexi watching the geese, also on a beautiful fall day. I'll bet she is thinking the same thing as Cody. It's difficult to believe that our girl is already 5 years old. I am looking forward to the fun we will be sharing in the next 5 years. We want to start rally and tracking. If only there were more hours in the day. 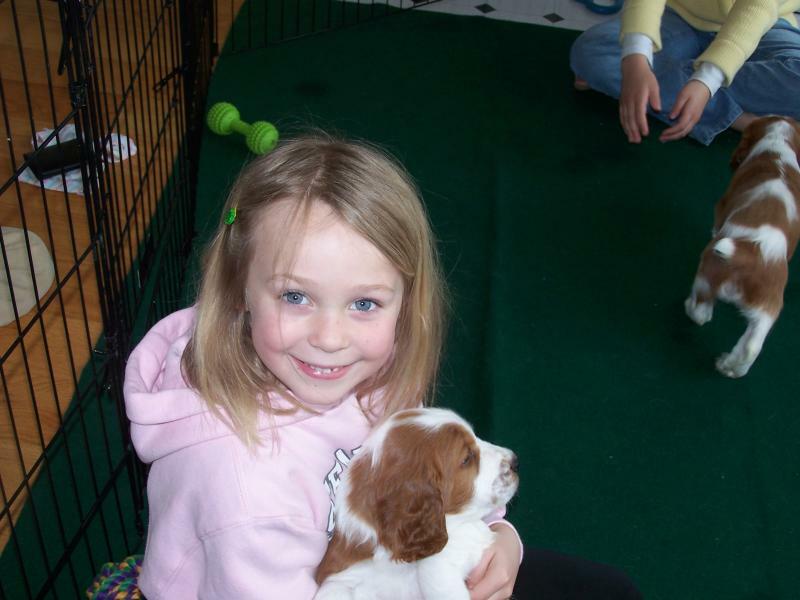 Love you so much Lexi! 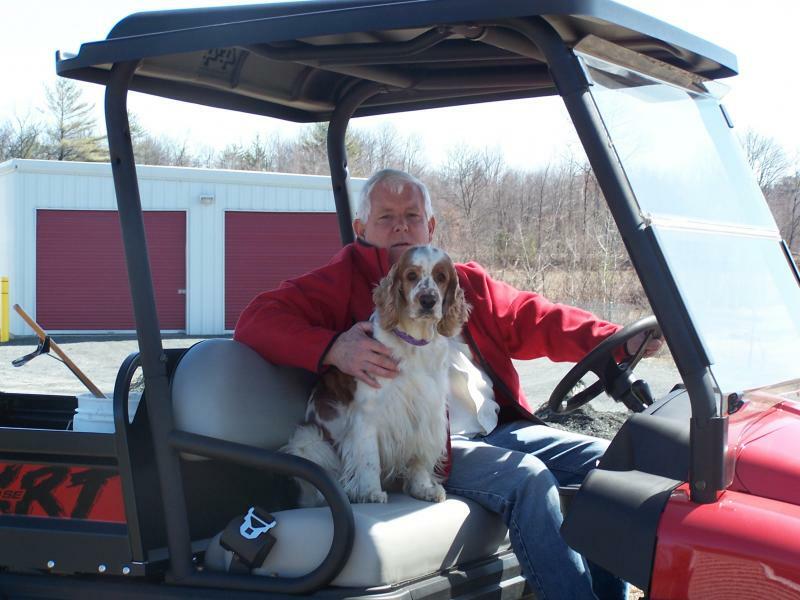 While Lily and I were at theWelsh Springer Spaniel National Show (see Lily), Russ and Lexi stayed home and kept everything running.When Lexi hears the Club Car start up she is first to hop in her seat. Then off they go to check everything out. 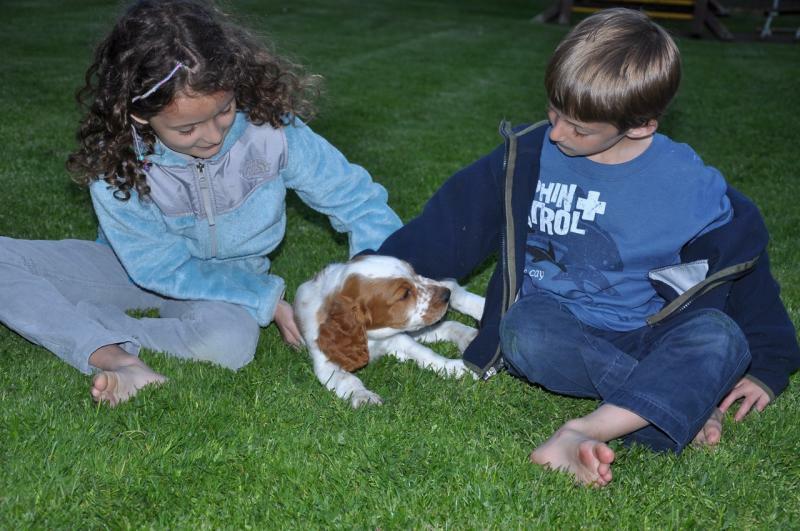 Thank you to the families of the year old Liberty Litter puppies for sharing new pictures of them with us. They are very lucky welshies to have such loving families. The pictures are great. A newmallard duck toy for Lily, our birthday girl and of course a new squirrel toy forher Mom Lexi.We can't believe our girl is already a year old. 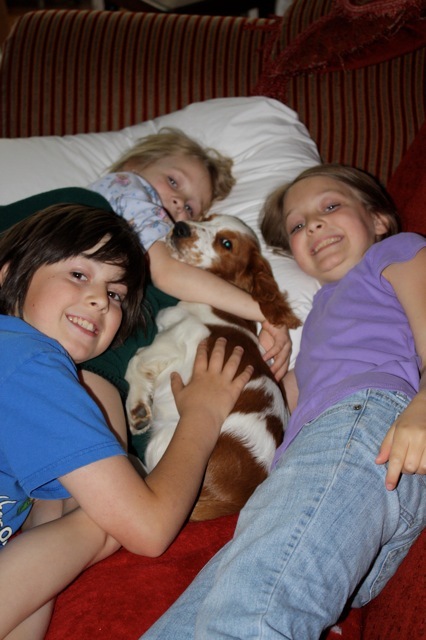 Cody is very lucky to have a family who loves him as much as they do. 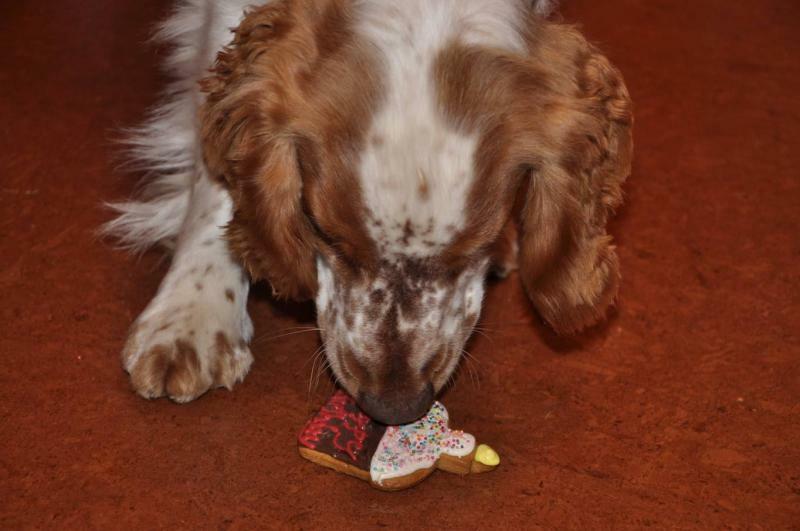 Cody was very lucky to get his own "pupcake" to celebrate his birthday. He sure looks like he likes it! What beautiful pictures of Holly and her family celebrating her firstbirthday.Everything in pink for their girl! Dexter having funwith his loving family. Looks like they think he is the "Star" of the show. 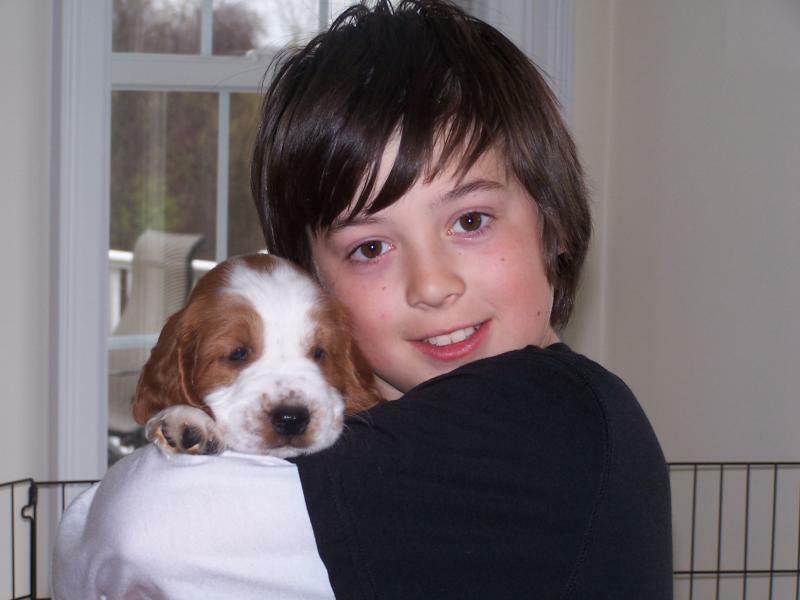 It seems like yesterday all of you were here to take him home. Look for "Birthday celebration" pictures in the next few days. We woke this morning to 15" of snow on the ground andmore still coming down. 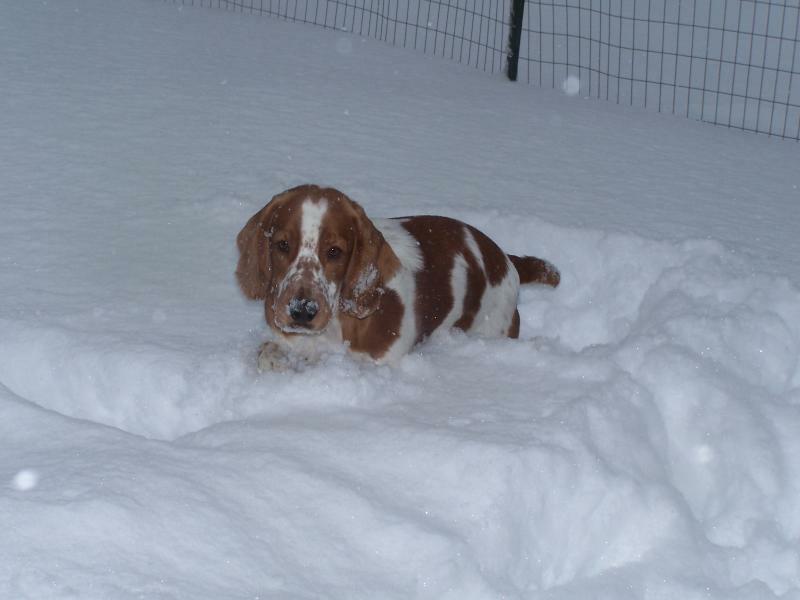 This was by far the most snow Lily has encountered in her young life. 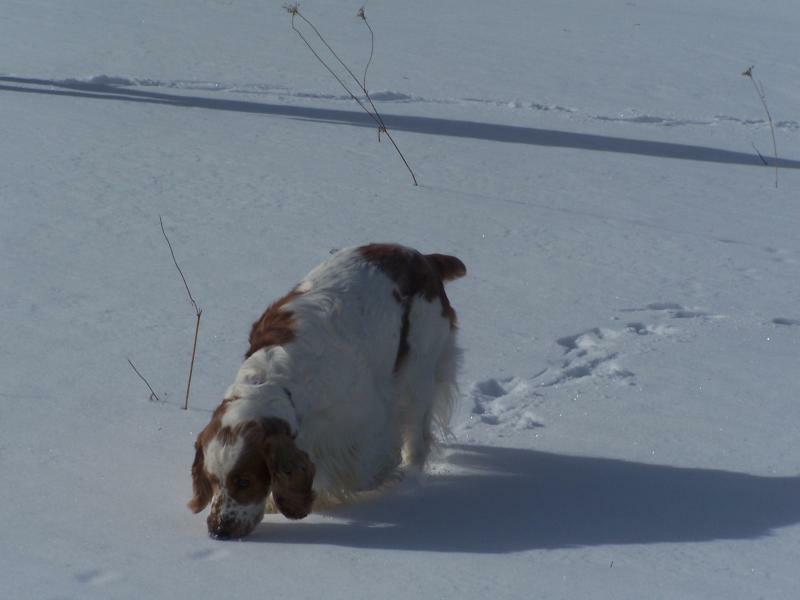 At first she wasn't sure what to make of the depth of the snow. 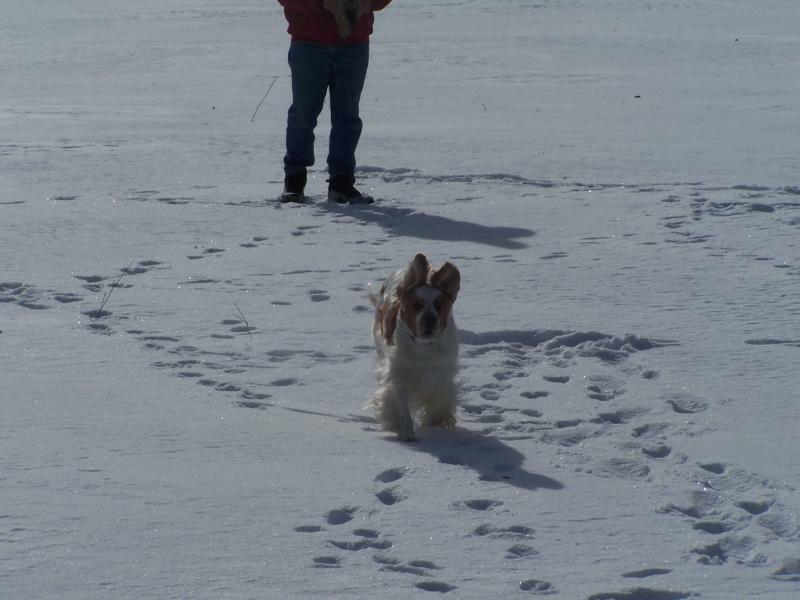 First Lily just followed in Lexi's footsteps through the snow. Then she discovered snow can be lots of fun and started jumping around and playing in it. 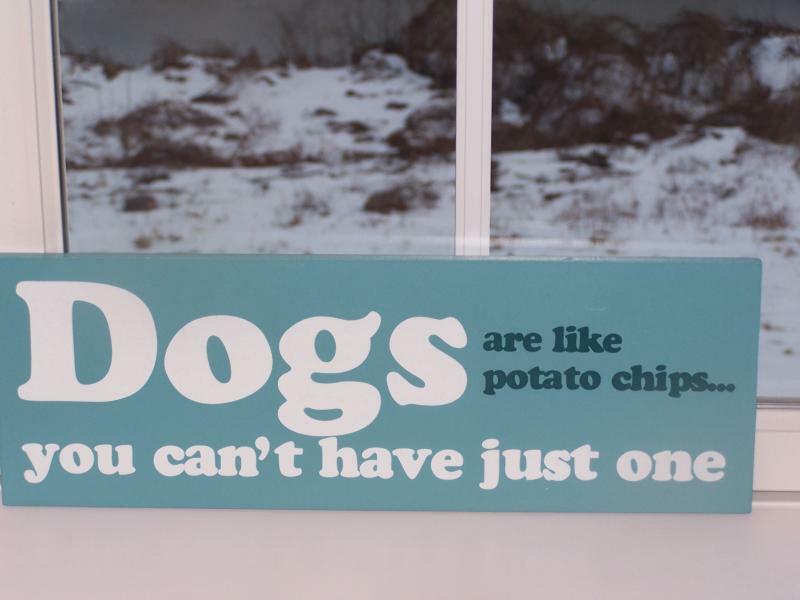 My Mother found this sign for Russ for Christmas. We laughed when we read it at the store and helaughed when he unwrapped it. EvenRuss had to admit how true it is! Gotta love those welshies. 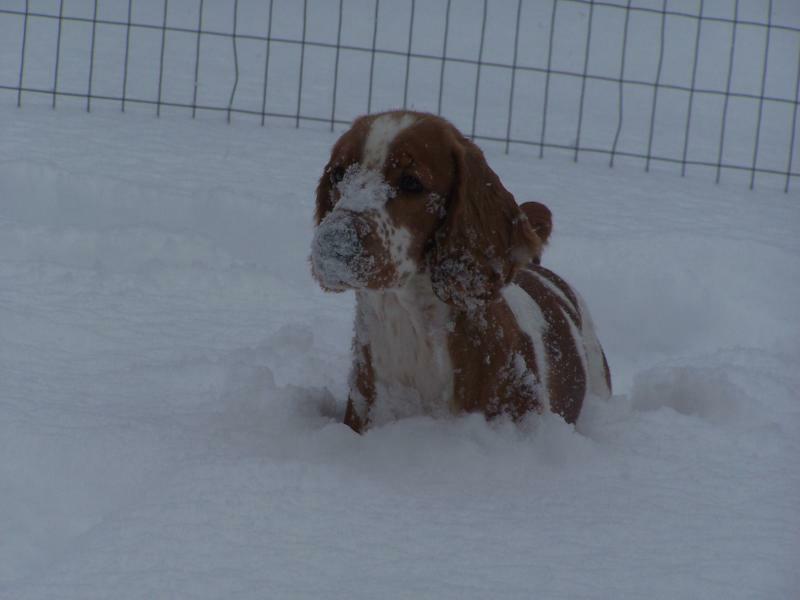 It didn't take Lily long to start digging in the snow like Lexi. What fun they had today. They didn't even mind the wind. 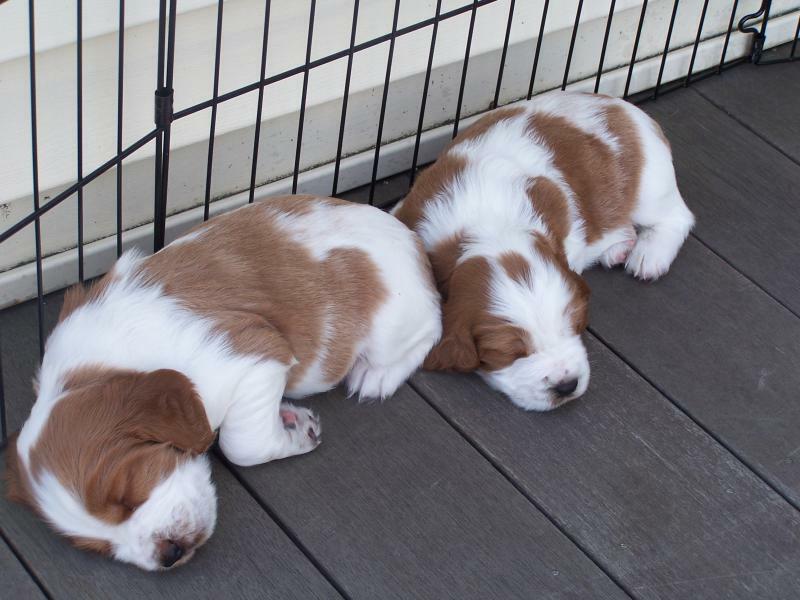 They played outside for a long time and tonight they are sleeping peacefully. What a wonderful present it was for us to receive new pictures of Holly, Lexi's Grace Lady Liberty. 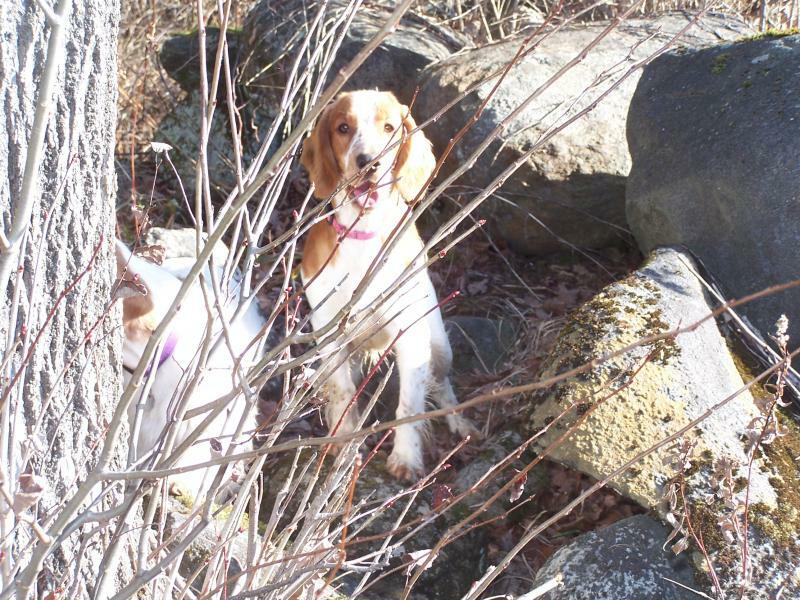 Hollyis a healthy active nine month old welshie, who enjoys her life. How lucky she is to have a family who love her so much and I know the feeling is mutual. We love pictures so please keep them coming! This picture should be a Christmas card it's so beautiful. 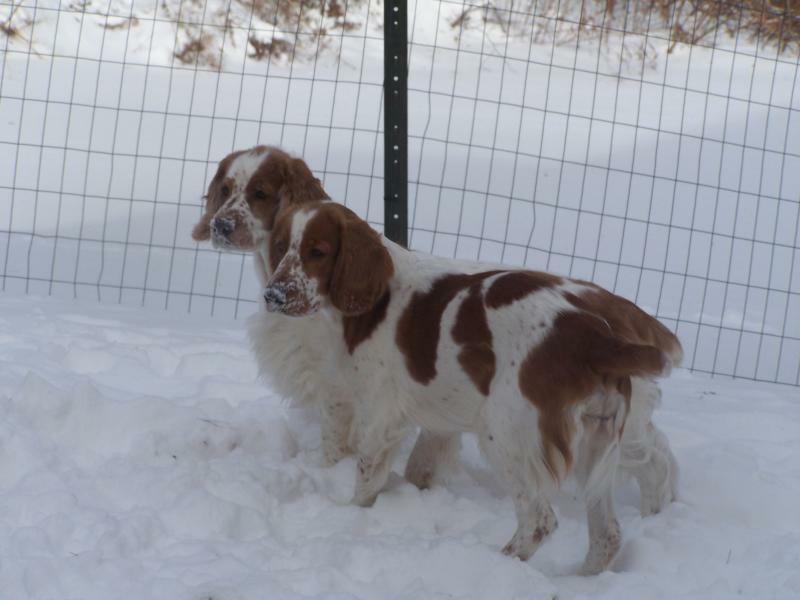 Holly looks just like Lexi, even with the snow on the tip of her nose. Today has been a wonderful day. Lily and Lexi have been very helpful as always! We have been out delivering cookies to friends which we made yesterday. The girlsare very happy to go along as not only do they get to visit losts of people but they also receive gifts from them. People are very generous to them. 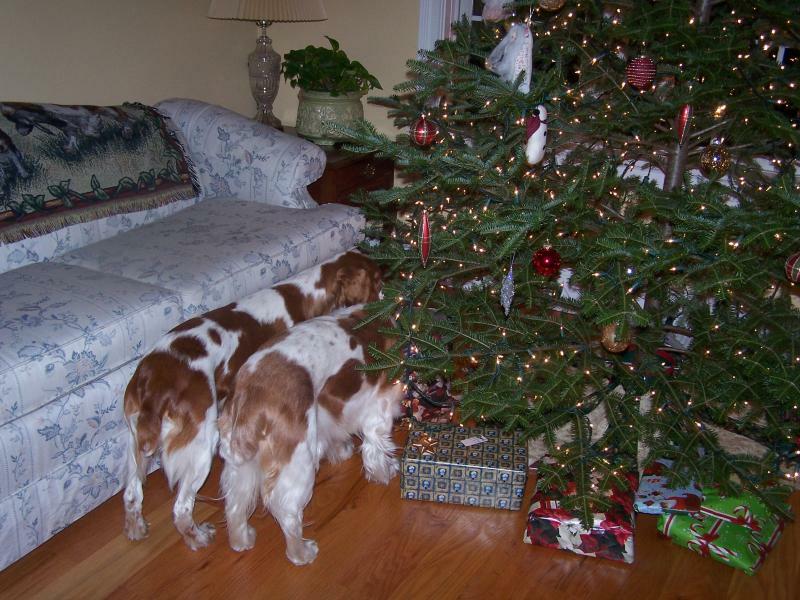 I just finished wrapping the last of the presents and was placing them under the tree when I turned to see our "precious angels" finding it very difficult to wait until tomorrow to open their gifts. Lily wasn't quite sure she was allowed to explore the gifts, however Lexi showed her how things are done and in the end I gave them each a treat from the bag from my sister a day early. 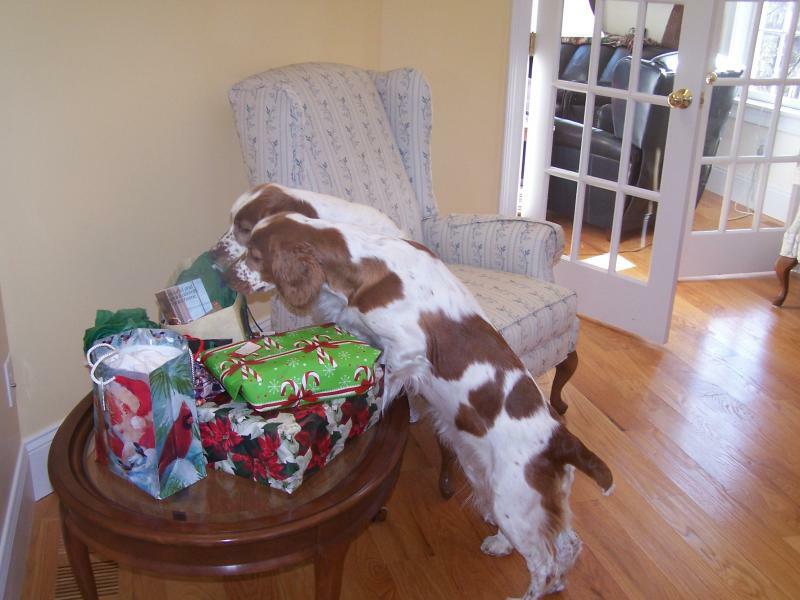 Christmas is so exciting-----especiallywhen you are a welsh springer. Oops Lexi caught in the act and Lily minding her own business playing with her pink ball. 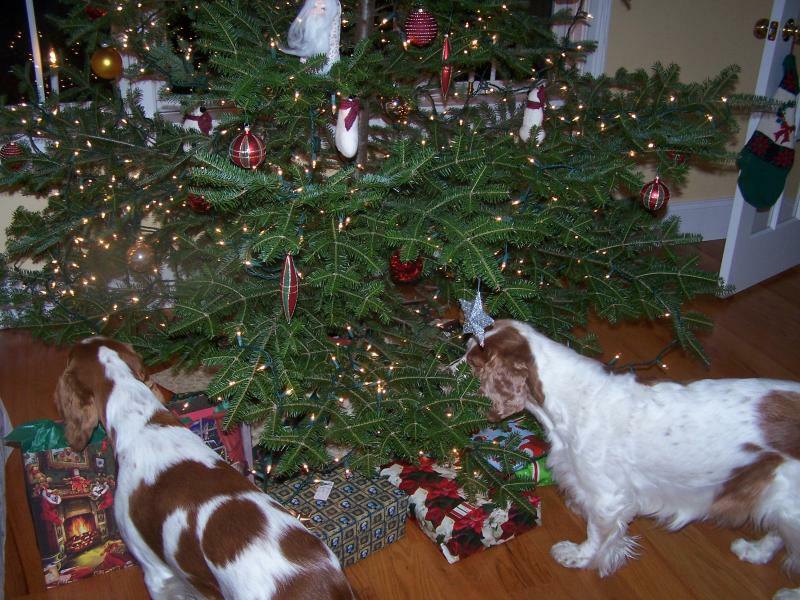 Lily is a quick learner--they both smell something good! Okay I let them have one of their presents a day early. That's part of the fun for me. May you have lots of smiles tomorrow! Thiswill beLily's first Christmas and she is enjoying every minute of it. Last Sunday we all went to cut our Christmas tree and then we went for a run. (well tobe honest, the girls ran and Russ and I walked!!) 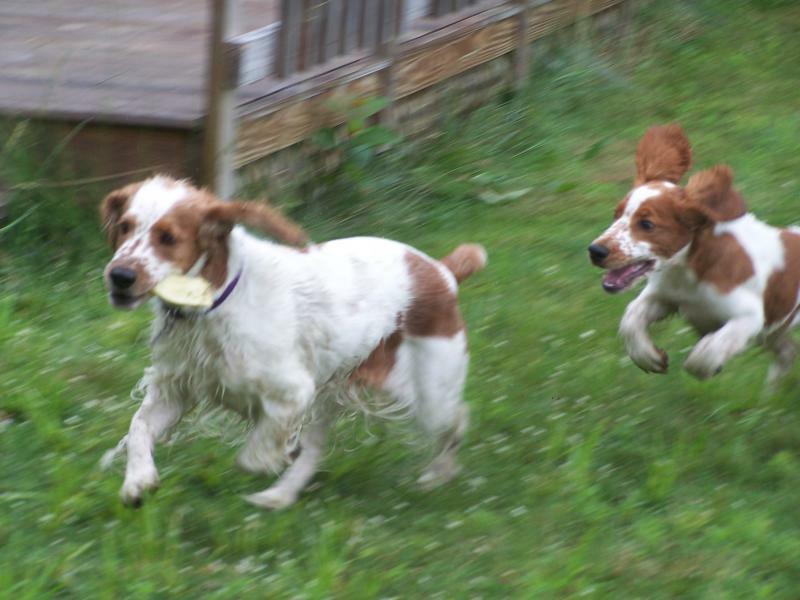 There is nothing as exciting as watching welsh springers doing what they do best----running free as they were meant to be. 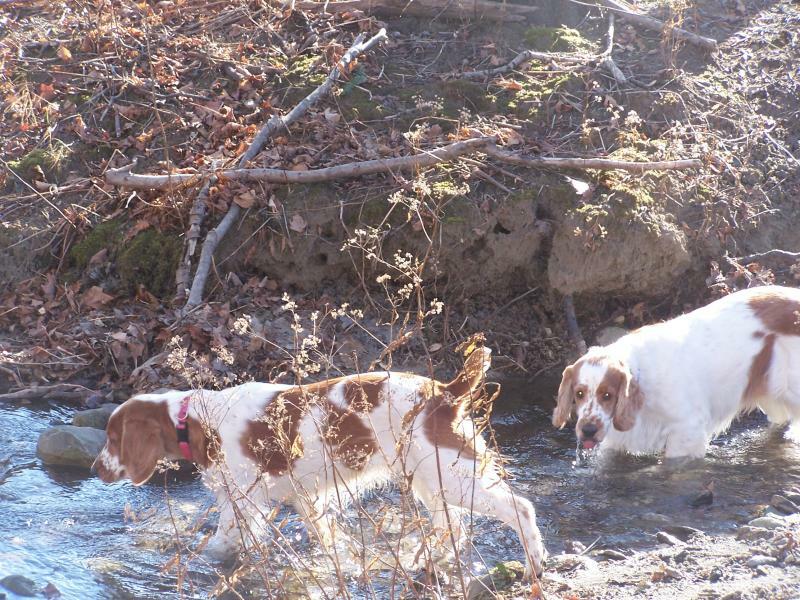 Both Lexi and Lily did very well checking back with us as they explored and smelled everything. Russ and the girls at the beginning of our walk. Lexi coming when called-my good girl!! They didn't stay in the brook as long as usual, only long enough to get a drink. The temperature was very cold. 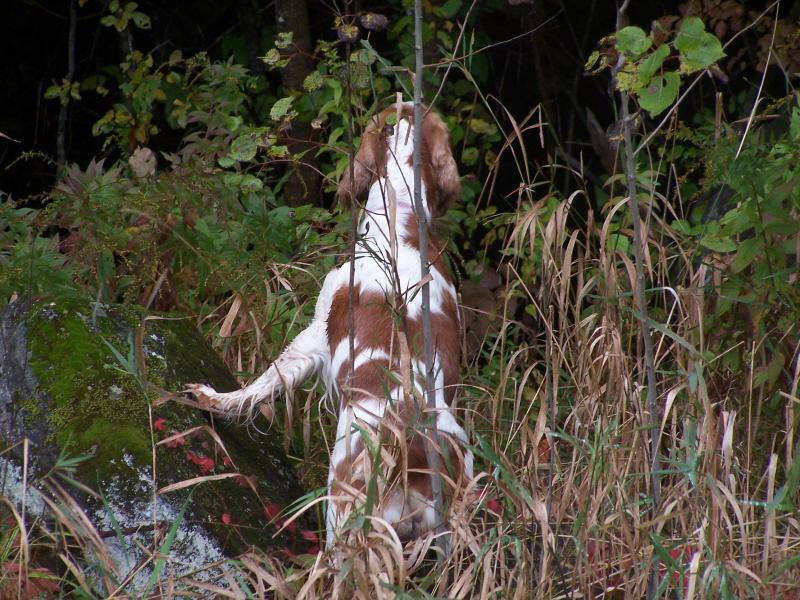 Checking for any birds or other animals they can find. Their noses are amazing. Lily taking a well earned break. 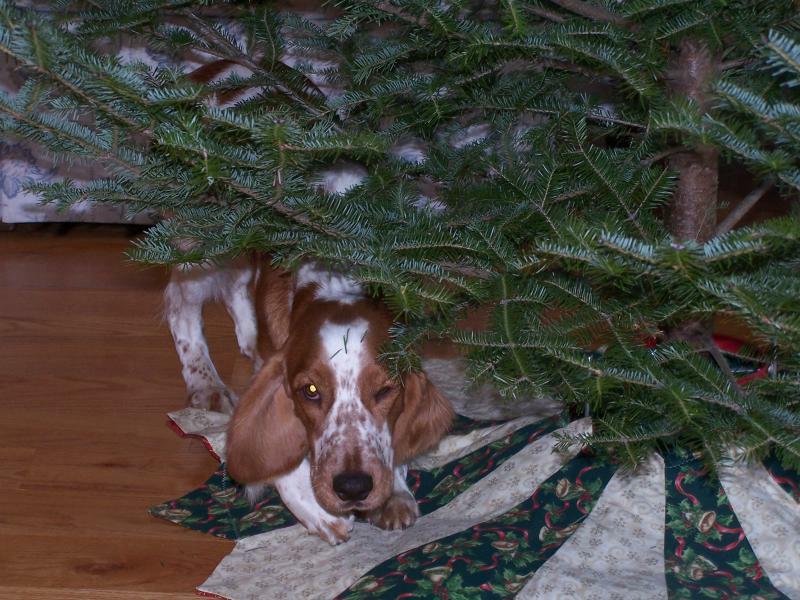 The Christmas tree and other decorations = lots of welshie fun! Look everyone--there is a tree in the house!! They put it here just for me or so Lily thinks. 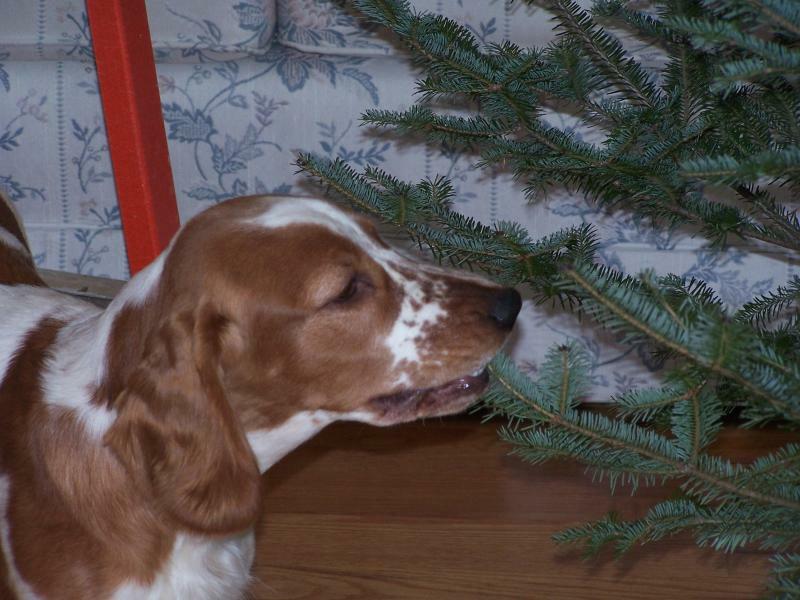 This tree tastes pretty good! This snowman seems to be Lily's favorite decoration. She carefully removes it from the tree, time and time again and then very proudly brings it to us. 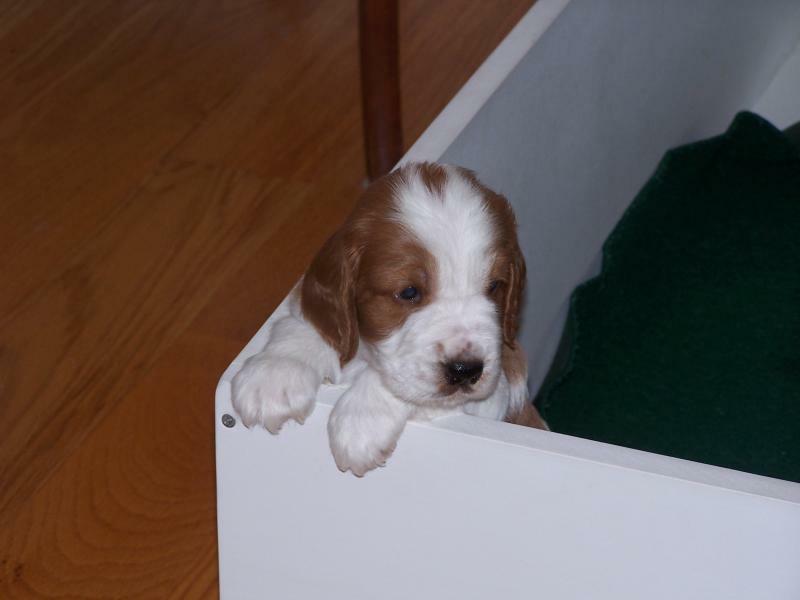 Oh our precious puppy, nothing sneaky about her, she wants us to join in her fun. I won't tell them if you won't! 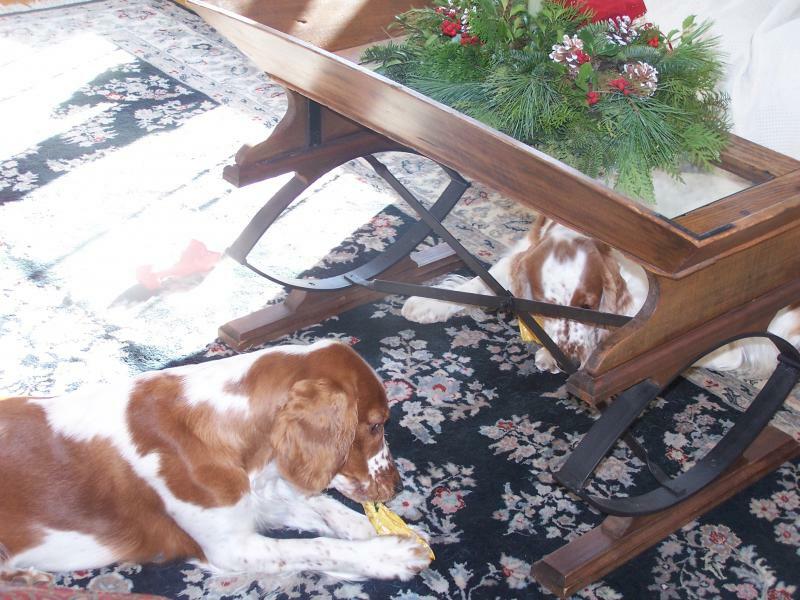 Both Lexi and Lily stay under the table when I am wrapping presents. When I finish with a roll of paper, they love to play with the empty roll. 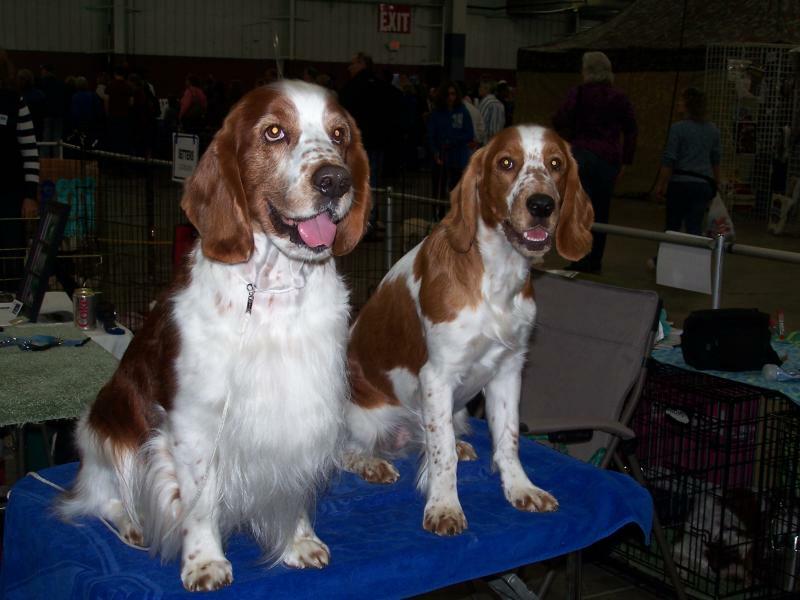 On Sunday, October 25th along with 2 other welshie friends and their dogs, we participated inAKC's MEET THE BREEDS. 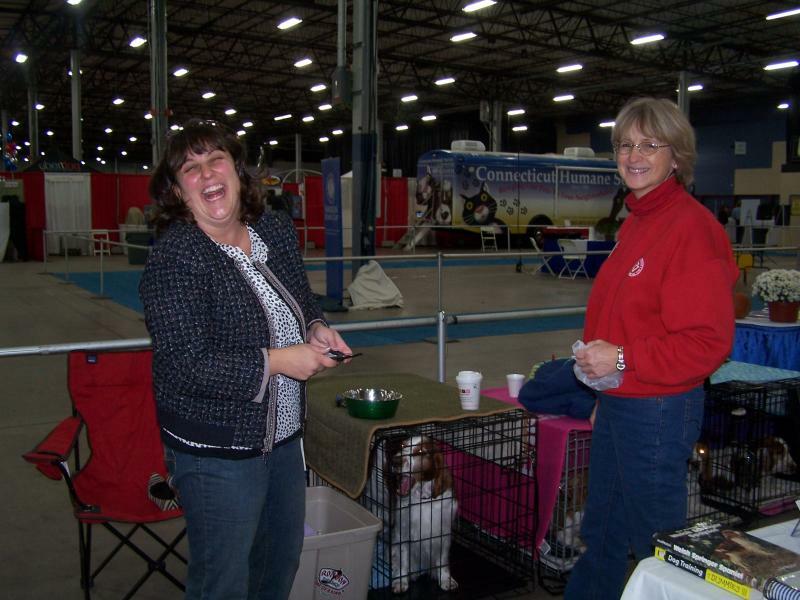 The event was held in Hartford, CT and was held in conjunction with the Pet Expo. 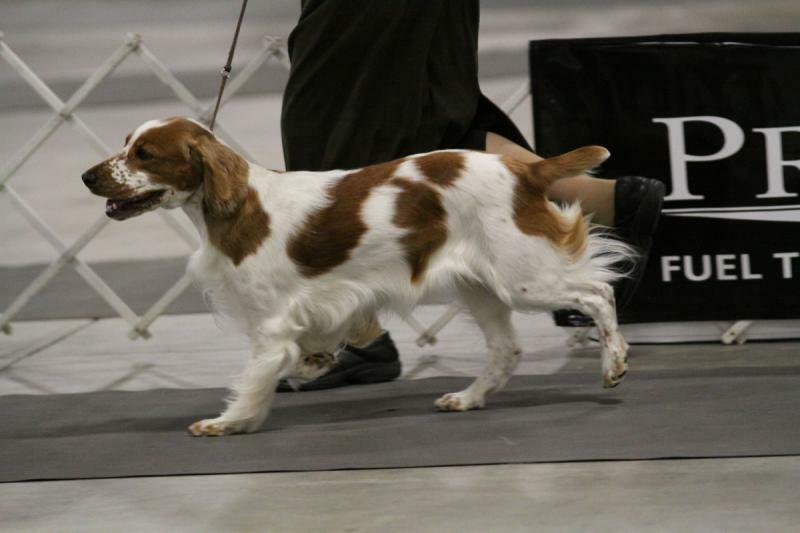 The purpose of the event was to introduce manydifferentAKC breeds to the public. We spoke to many people andour dogs received lots of hugs and kisses.It was a worthwhile event. Milo and Lily ready to meet new friends. Who wouldn't want to pat them. Wehad a wonderful visitwith Cody, Lexi's Grace Walking Liberty,and his familylast weekend. Lilyand Cody had so much fun playing with each other.Cody is a beautiful healthy boy and we were so happy to get to see him againand hug him of course!When the 3 dogs were together, there was no doubt they were related. His family is taking very good care of him. Lexi is happy to be outside the penenjoying her visitorsandthe new Halloween toy they brought her. 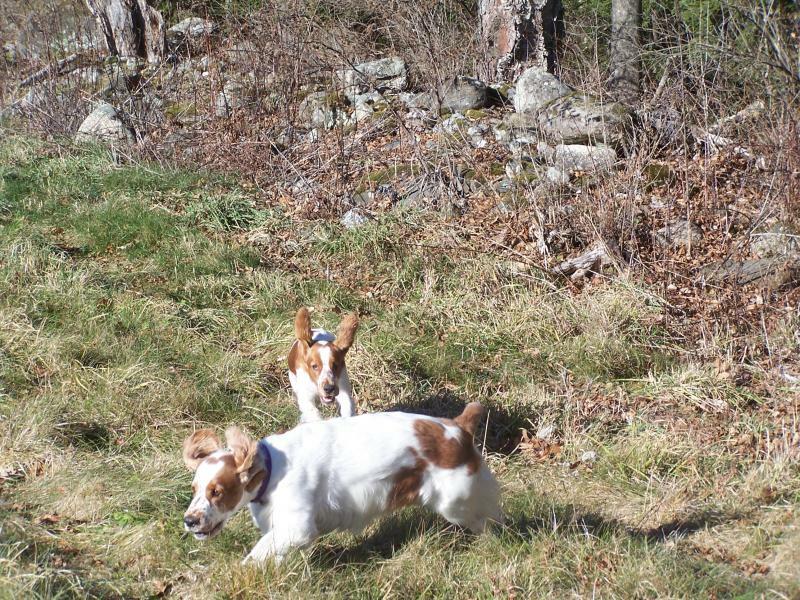 As you can see the canine siblings are enjoying themselves behind her. 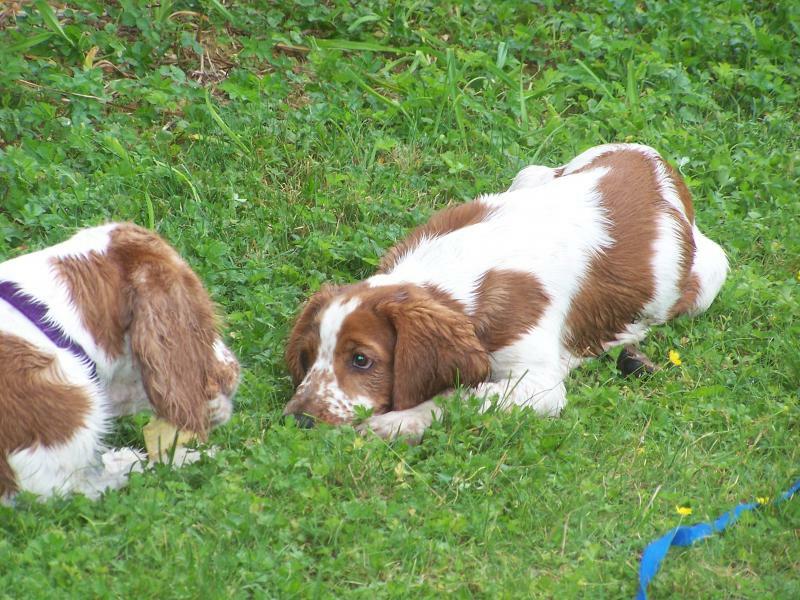 I am happy to share updates and photos of 2 of the puppies from the Liberty litter. 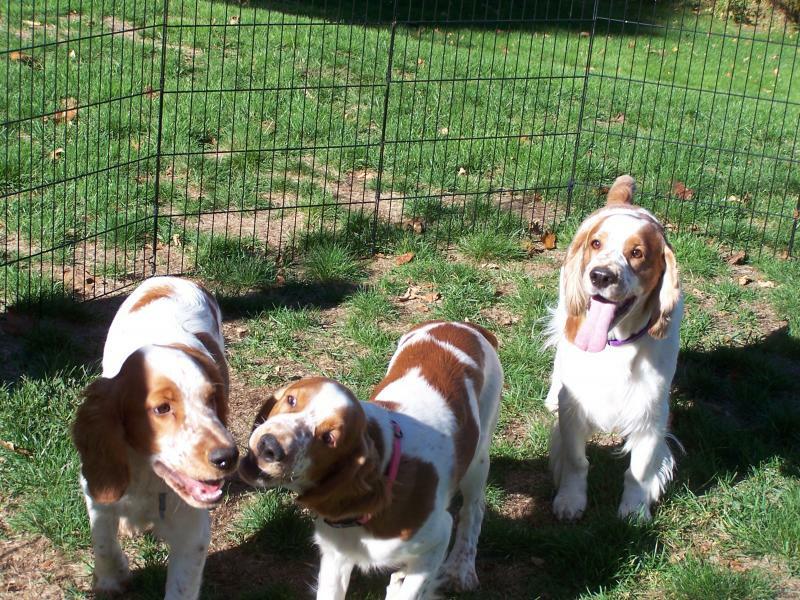 Thanks so much to their owners for letting us see how they are developing and being active members of their families. We love pictures, so please keep them coming. 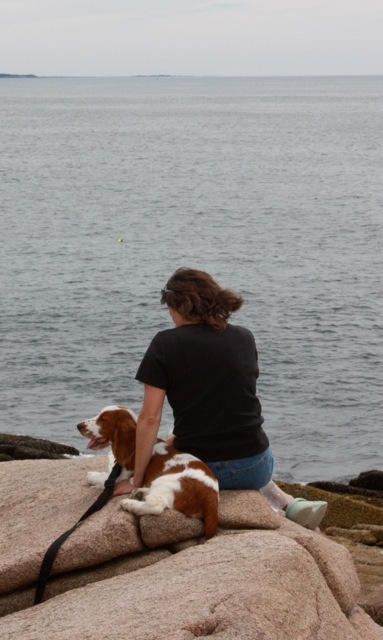 Gus, Lexi's Grace Liberty had a wonderful time this summer in Nantucket. What a lucky boy to have been there with his family, I am envious! Now this is a place where Gus can dig and not get into trouble for doing it. Lily would love to be there too. Cody, Lexi's Grace Walking Liberty, was lucky enough to vacation with his family too. 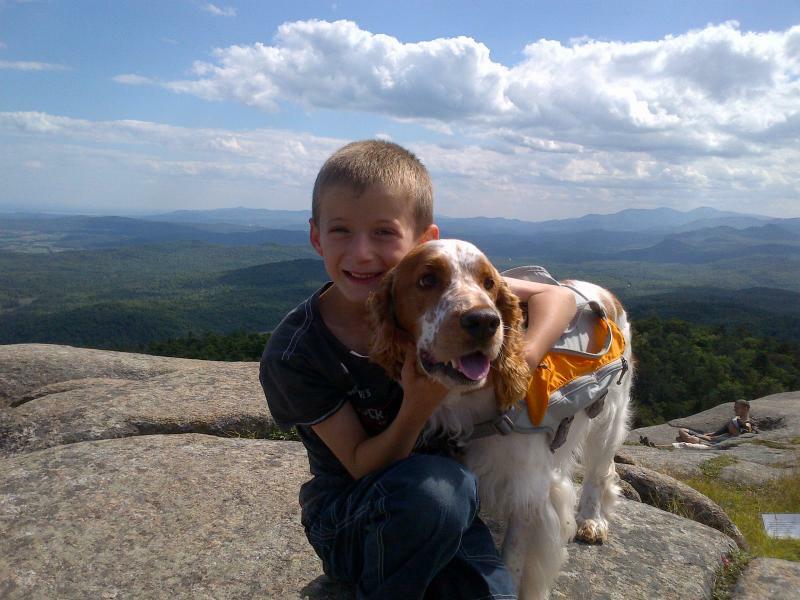 He went on his first hike up a mountain above Squam Lake in New Hampshire. What a beautiful view. He does look like he is King of the Mountain, doesn't he. What good family members these 2 boys are. 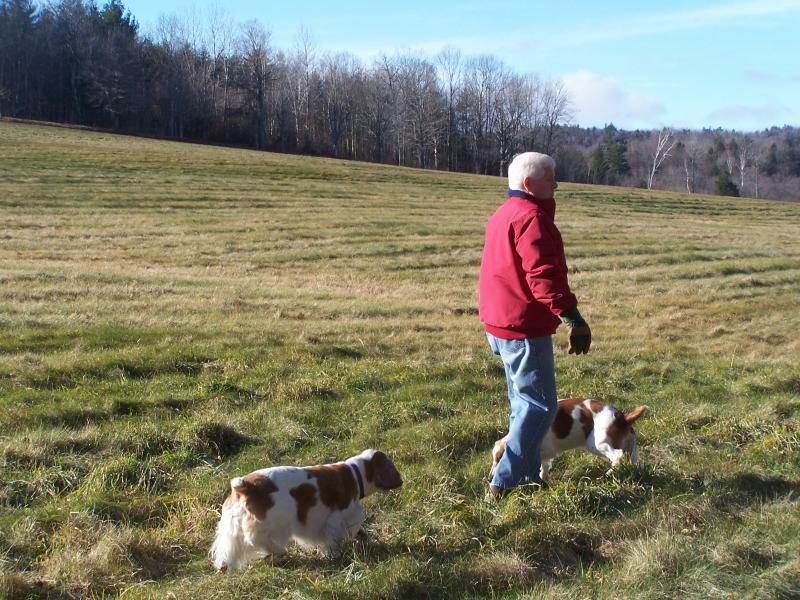 Thanks again to their owners, for giving them such good lives. I was making chowder this afternoon when I realized the two girls had joined me in the kitchen. Lexi alwayslikes tolay on the rug while I fix meals and knows that she doesn't geta treat until dinner is over.However our 5 month old puppy Lily hasn't quite learned this yet.She hopes that if she looks cute enough she might getsomething. Lily nothing until after dinner!! We were very pleased to receive pictures of Holly (Lexi's Grace Lady Liberty) from her owners recently. It is fun to see how she is growing up and enjoying her life. 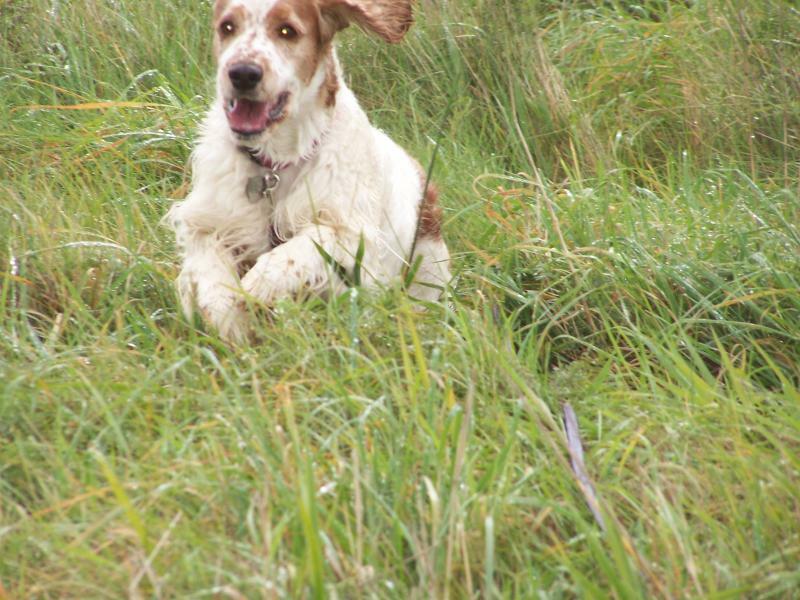 You can certainly see that she is a SPRINGER Spaniel. Most of all we can see how loved she is by her family. Thanks for sharing her with us. 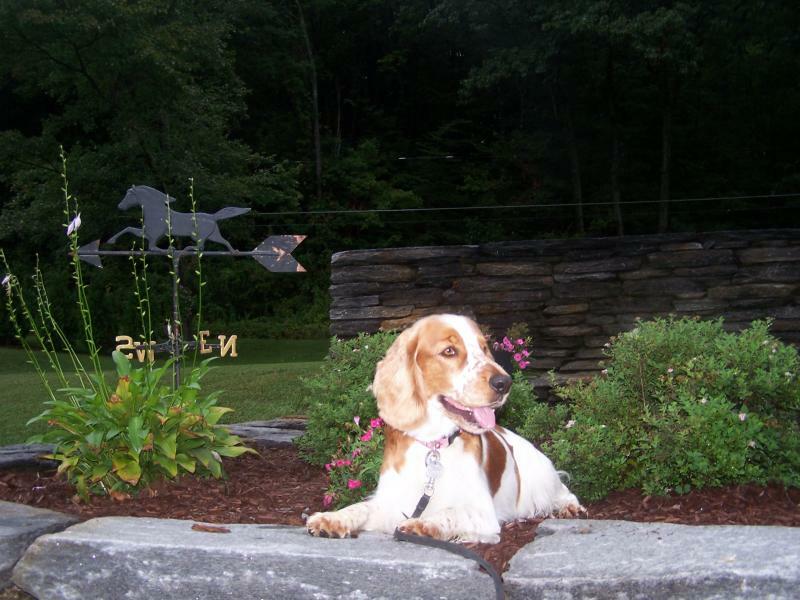 Thanks to Gus's (Lexi's Grace Liberty) owners for sharing pictures of him taken recently. 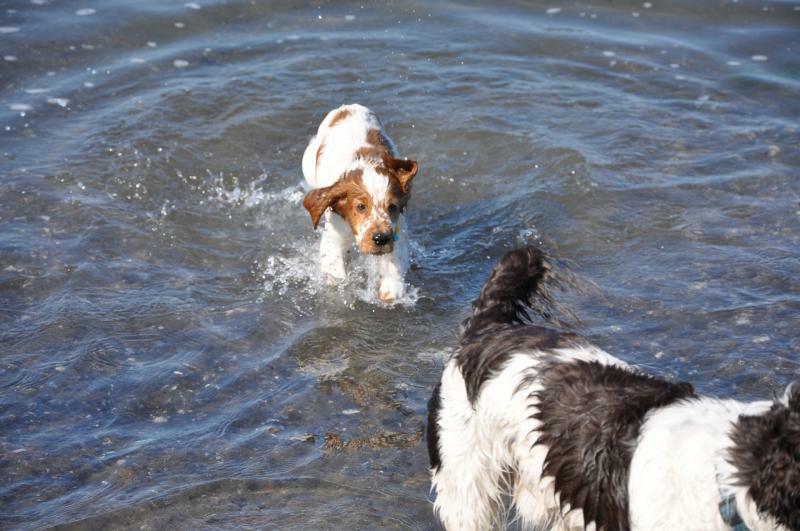 Gus like his brothers and sisters loves the water. Most of all I know Gus loves to be with his family. Thanks for taking such good care of him. He looks wonderful. This morning the girls and I went to visit my sister who lives on a lake. It has been so hot here that we went early to try to beat the heat of the day.The girls had so much fun in the water, then chasing each other around the yard, then back in the water. I got tired just watching them. My sister always has special treats for them and the girls just love her. Are you sure you don't want to share that rawhide with me!! Last Sunday Lexi, Lily and I spent a wonderful day with other welshies and theirowners for a dayof introductoryfield work. It was sponsored by the New England Sporting Group Association. It was very humid, but lots of fun and educational. We plan to continue our training on a regular basis. 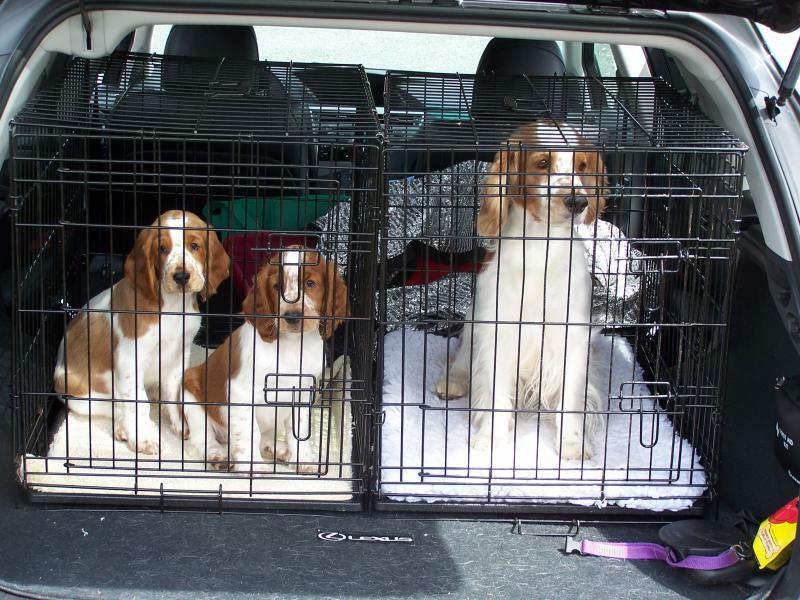 The dogs all enjoyed themselves and slept well on the drive home. I am hoping Lily has the same kind of nose as her mother, Lexi. Lily recently witnessed Lexi flush a pair of woodcock from the brush and wasn't sure what to make of it. She did know one thing for sure and that was that Lexi was very happy. Lexi and I will be starting Tracking class in the next few weeks. I think we will both enjoy it. 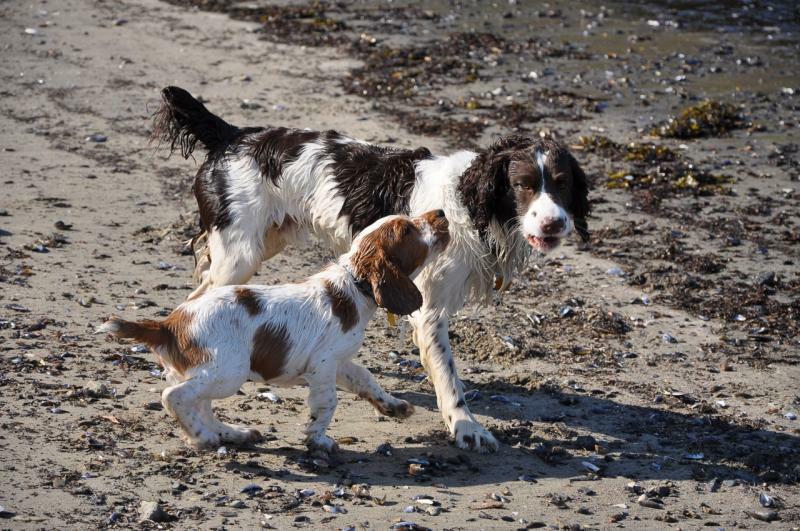 Cody,(Lexi's Grace Walking Liberty),is having a great timeat the beach with his new friend. 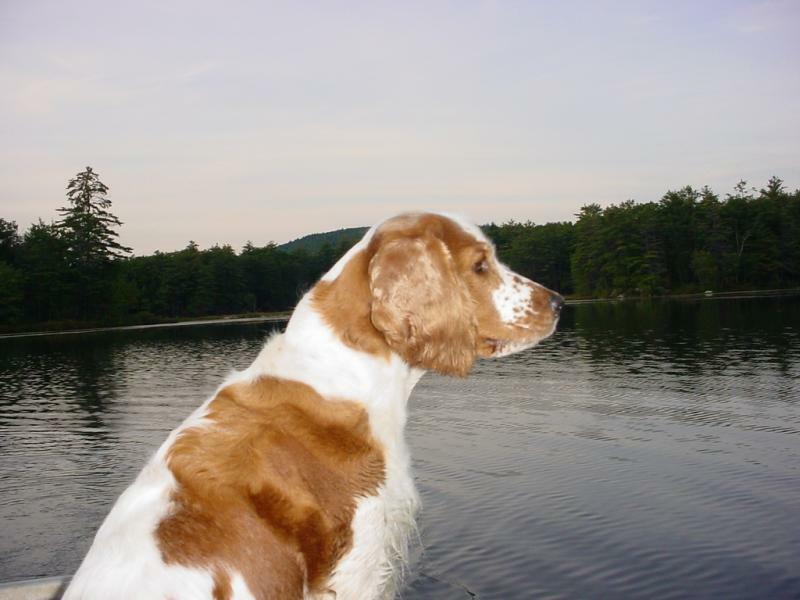 Is there anything better than seeing a welshie enjoy the water? Well maybe the only thing better is for him to be enjoying his family. Thanks for sending pictures, it's great to watch him develop. Today the 3 girls (Lexi and her 2 daughters Holly and Lily) went to work with me for the first time. They had a good time playing in the yard and meeting people when they came in. 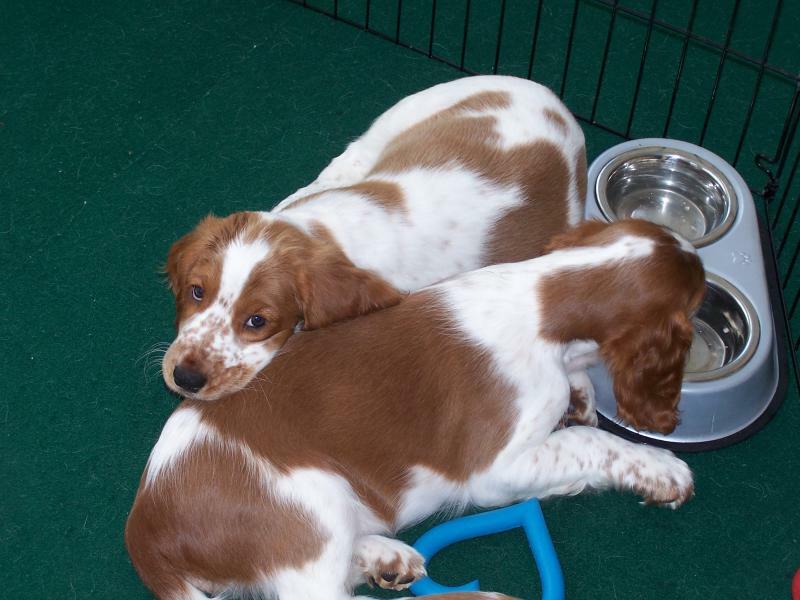 Then they did what all good puppies do, get a drink and then fall asleep. 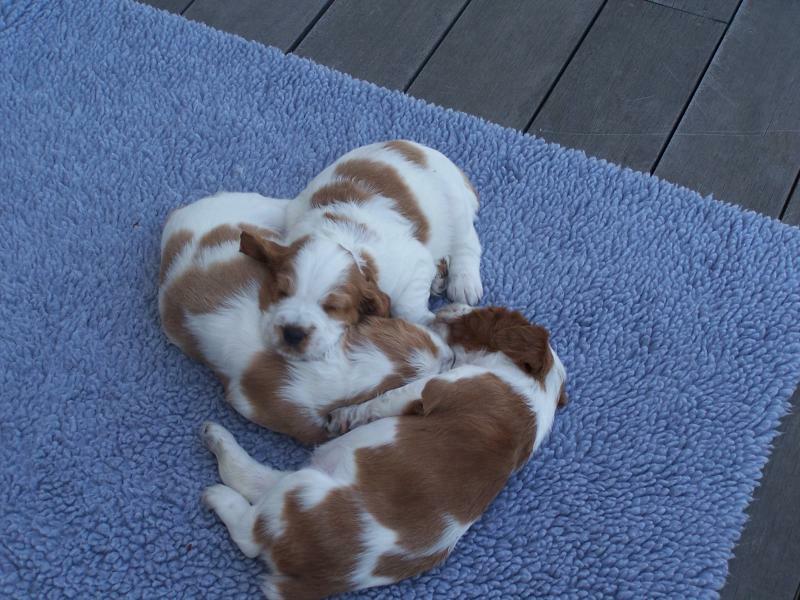 It's hard to believe but the puppies are now 6 weeks old. 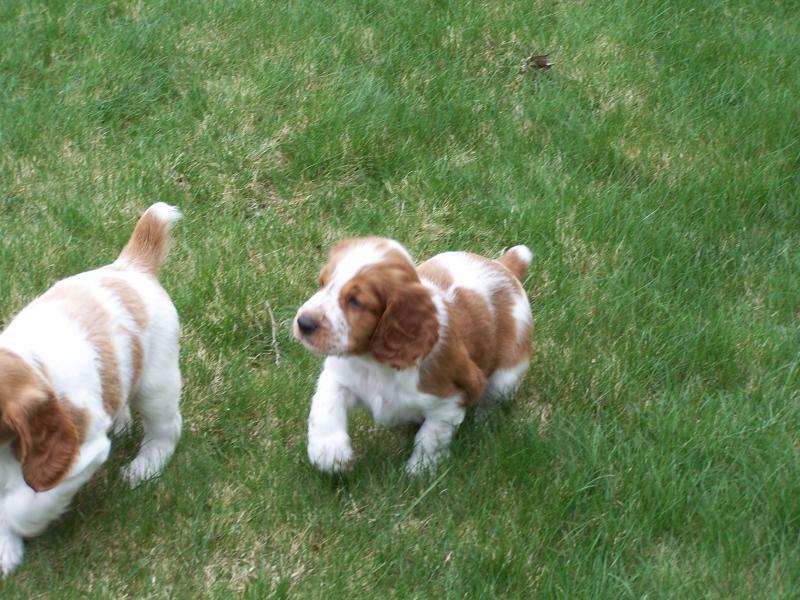 They are full of energy and personality. 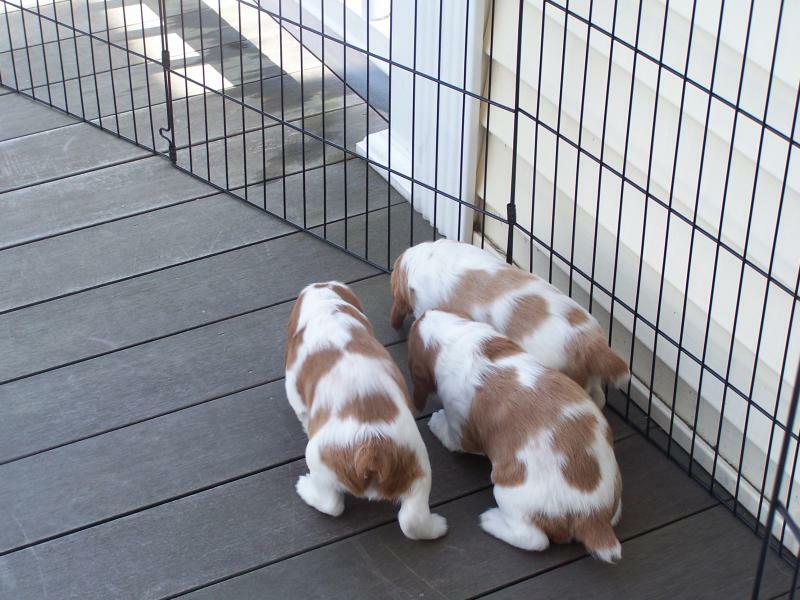 They are now in a large pen in the living area of our house, where they can run around and play with each other.There are many types of toys in the pen for them to play with. 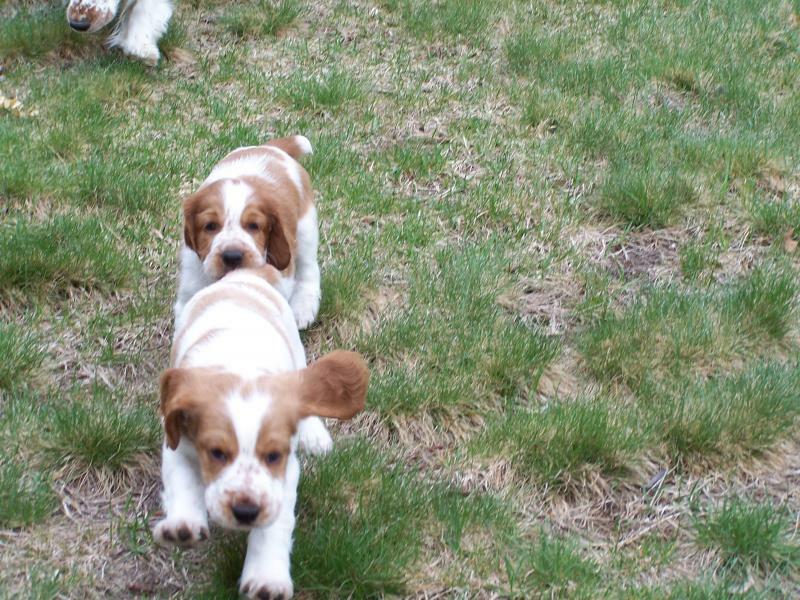 Many of them move and make sounds.These toyshelp the puppies get used toall types of sounds and movementand not be afraid.We want the puppies to be confident. 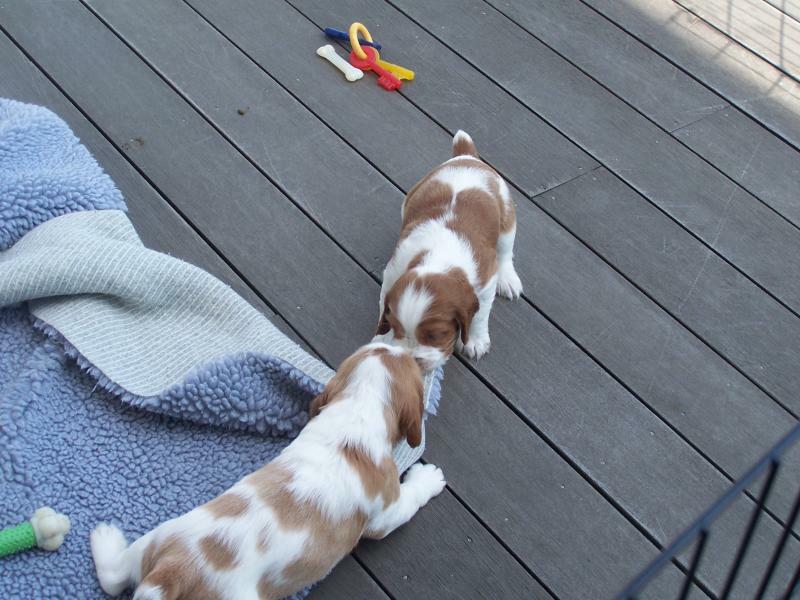 We are also taking the puppies outside to play everyday. 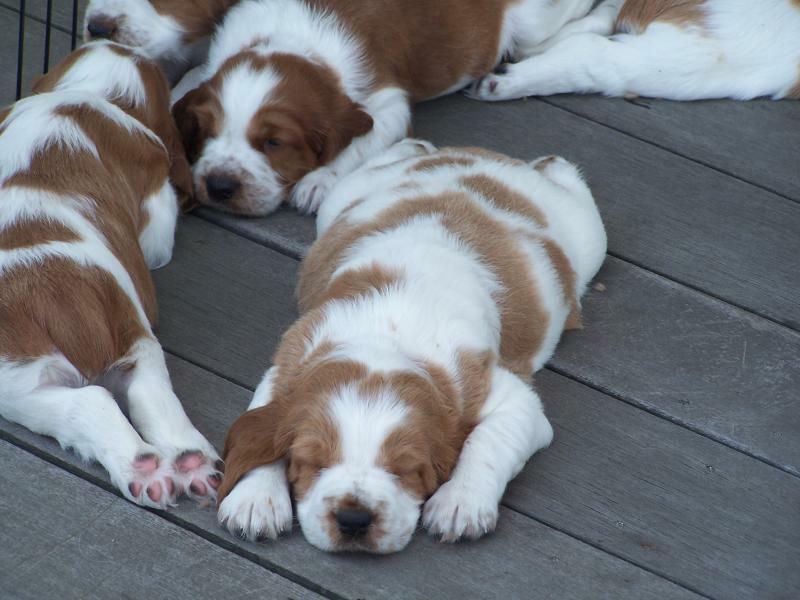 They have so much fun and get so tired out. Then it's inside for a nap. 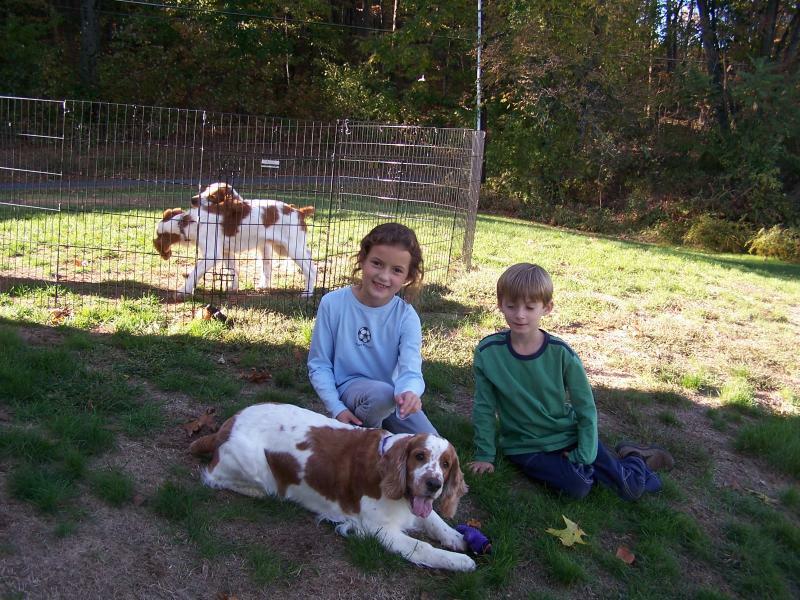 This weekend Lexi and the puppies had some special friends over to play with them. 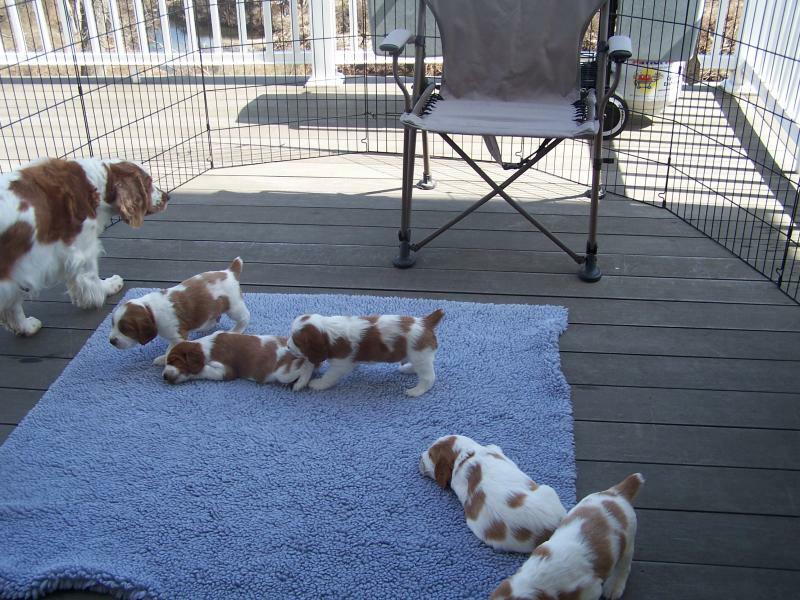 They thought it wasso excitingthat everyone got into their pen and played.Six dogs and 5 people in the pen now that wasfun to watch. 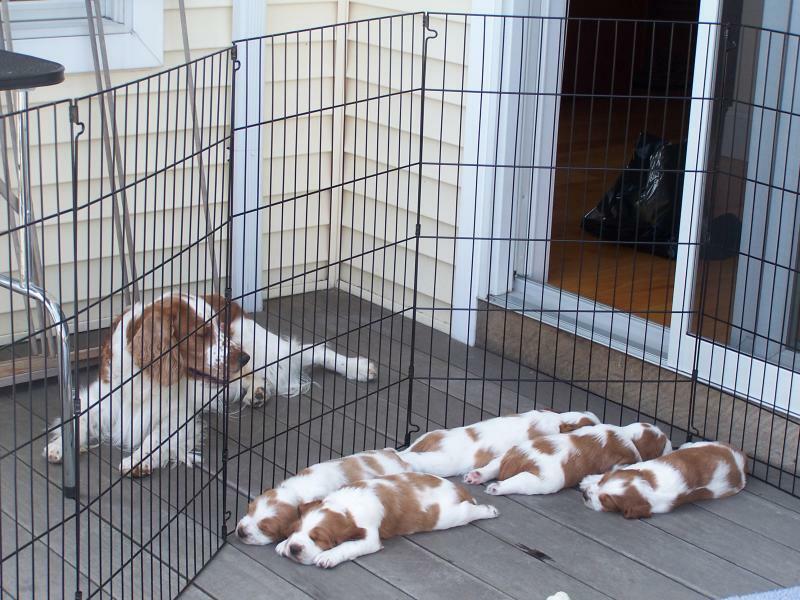 Lexi and the puppies thought everyone was there just to play with them and they were right!Finally the puppies just dropped and fell asleep. What an exciting day for us all. 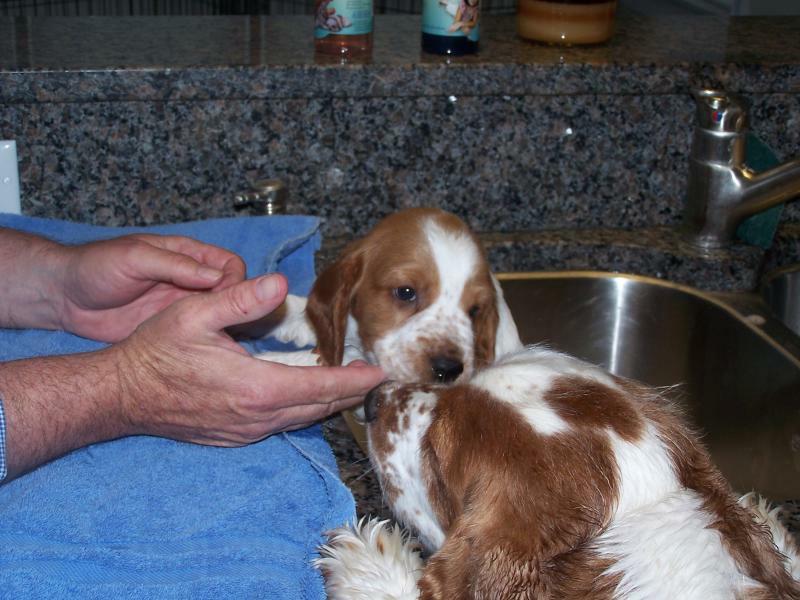 The puppies seemed to enjoy their first baths tonight.They showed no fear when they were in the water or when they were being dried off. They did have alot of energy when they went back into their pen, which is normal after a bath. 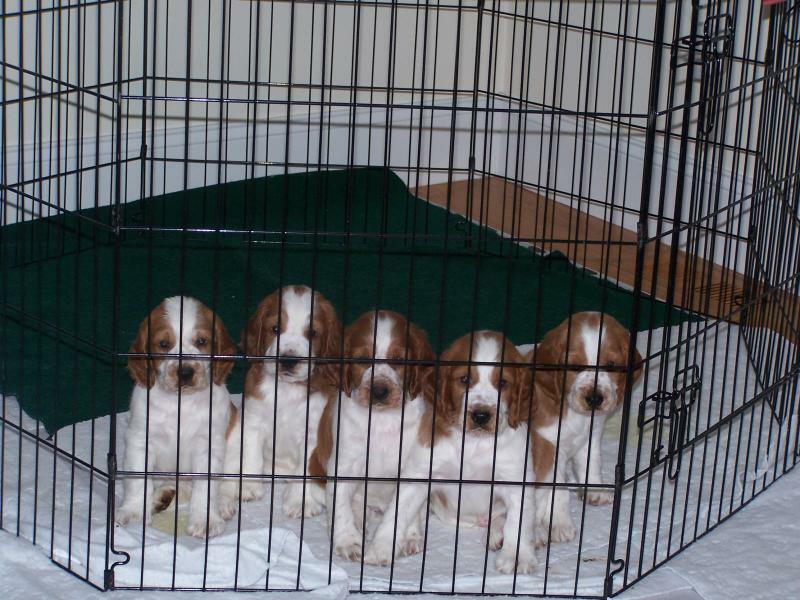 Such fun to watch 5 happy puppies. They won't be able to keep me in here much longer. Tug of war between the girls. Faces to melt your heart. 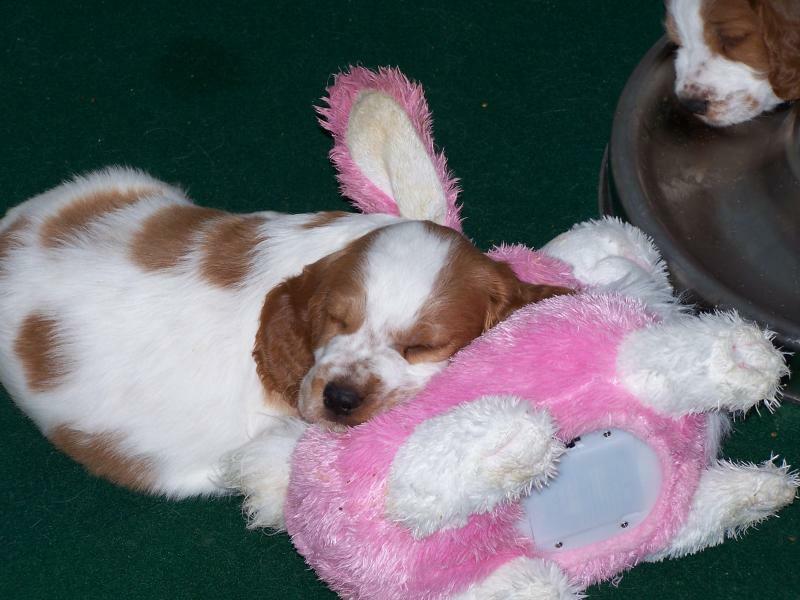 After an afternoon of play, the puppies sleep and Lexi can finally relax. Everyday Russ and I try to expose the puppies to new sights and sounds.The more the puppies encounter without fear the more confident and happy puppies they will be. Every night we takes turns while we are watching television, holding the puppies, during which we time we rub their feet and bodies, so they get used to being handled. 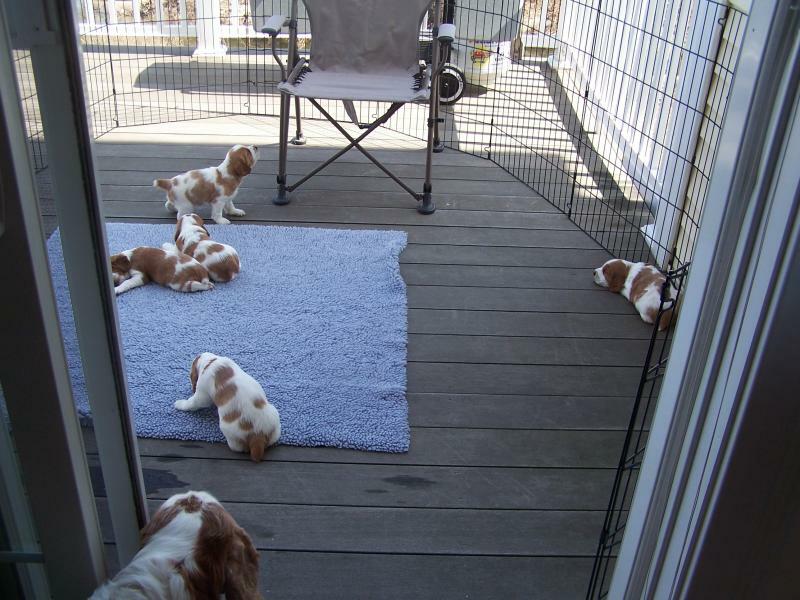 As the weather has been amazingly warm for New England, we decided today would be a good day to spend time outside on the deck in the exercise pen. 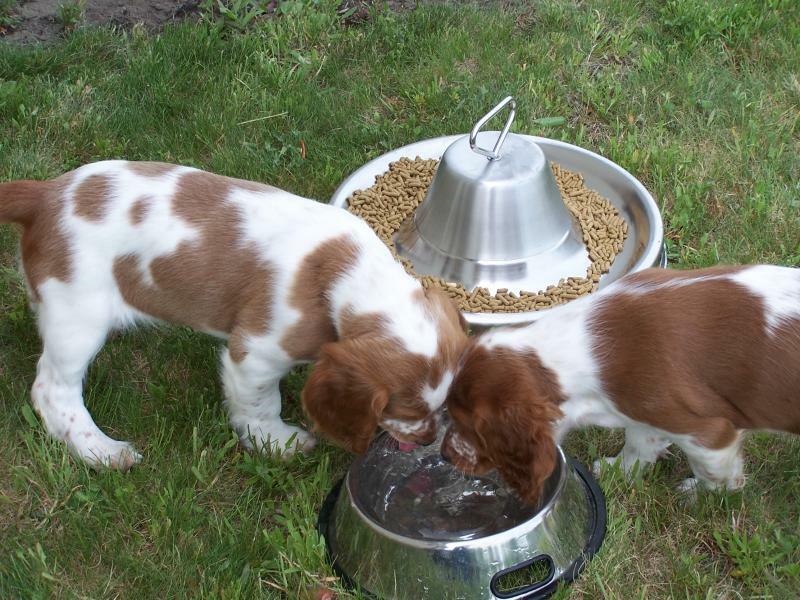 The puppies were fun to watch.They even splashed around in Lexi's water dish. They have never had so muchspace to play in before. In the end after having a snack, thanks to Mom, they all fell asleep. What a nice afternoon for the LIBERTY litter. 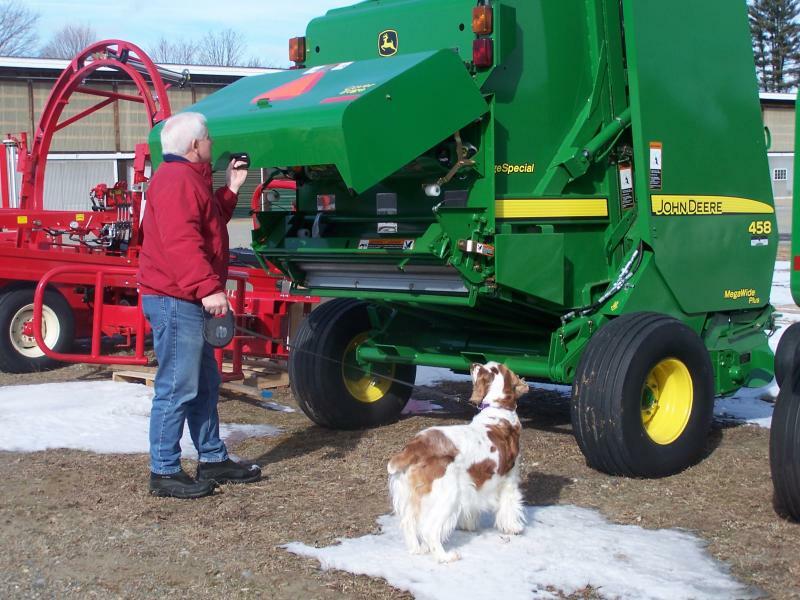 Even though Lexi will be having puppies soon, she and Russ were out looking at hay balers.Everyone at the equipment dealerships know Lexi and come right over to say hello.She loves being with Russ when he is driving the tractor. She really is a country dog. Now that Lexi is carrying puppies we are very aware of the fact that she needsto continue exercising to keep in good shape. This morningit was 28 degrees and a greattime for a walk in the country. Most of the walk was uphill which was good exercise for all of us. 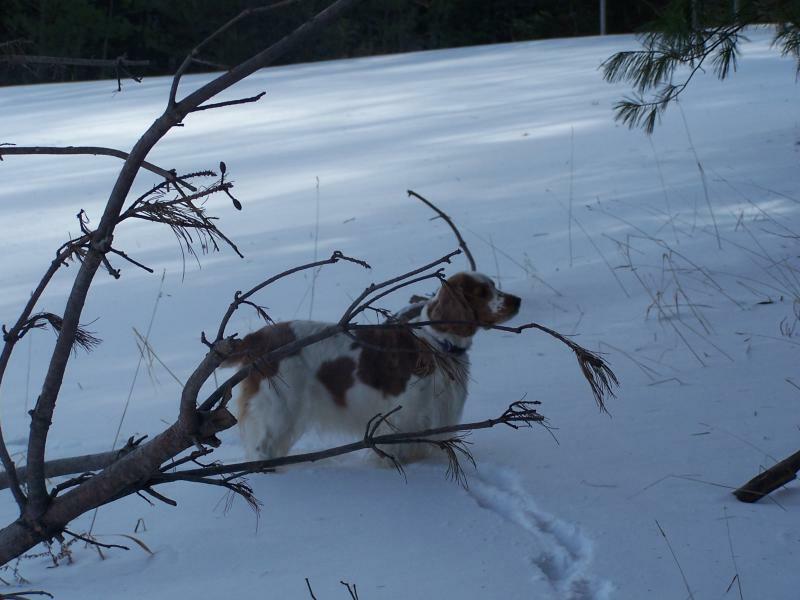 Lexi has such fun when she is off leash, it gives her lots of time to find interesting things to smell. She picked up the scent ofmany creatures, large and small. 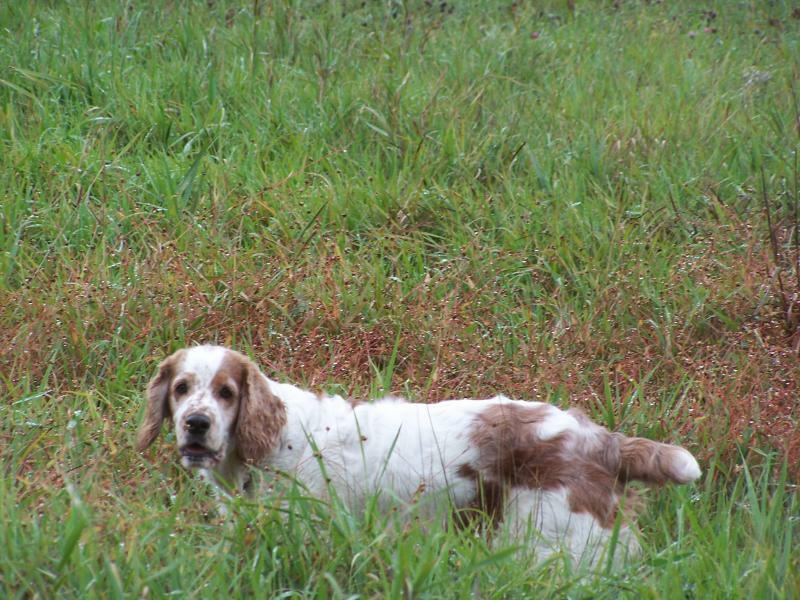 In addition she flushed 2 partridge from their hiding place in the thicket, now that was exciting to watch! We just got back from our nightly walk which Lexi and I both enjoy. 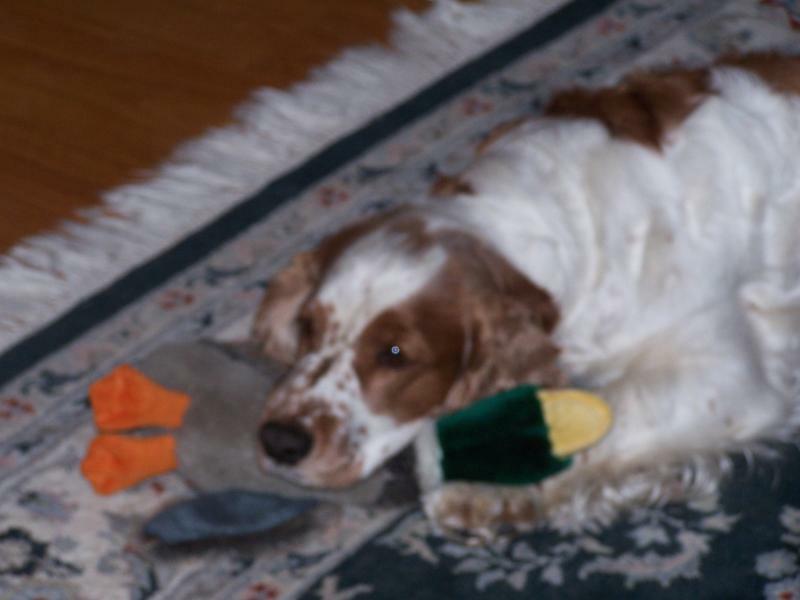 I looked up fromreadingand saw she was relaxing on her favoriteduck, which she received from our niece for Christmas. Luckily I was able to get the camera out of the car and return before she got up to see where Ihad disappeared to.I think the picture is adorable. I decided to wrap a few presents today and my "helper" Lexihad to check out each bag. 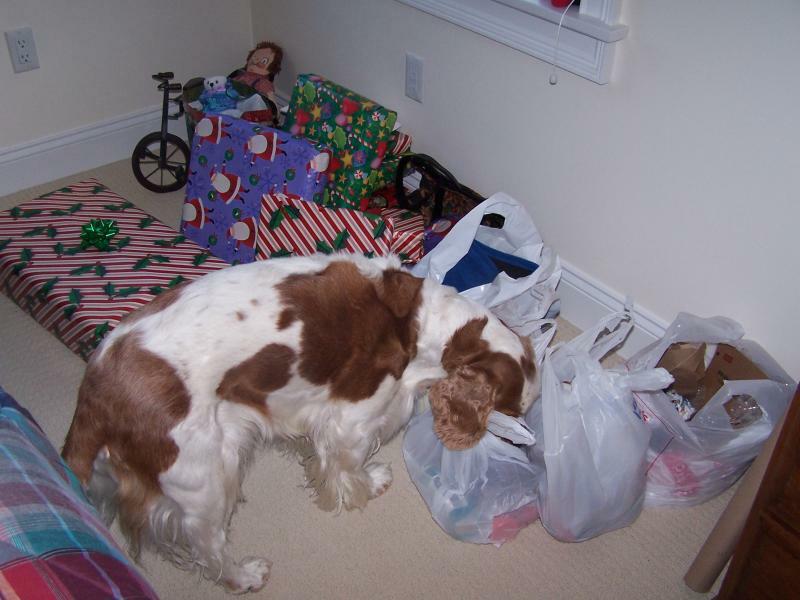 Good thing there weren't any of her presents in any of them, those are hidden away! Todayis November 30th, which means it is Russ' birthday and therefore the daywhen I can finally give himthe gift I had made for him. 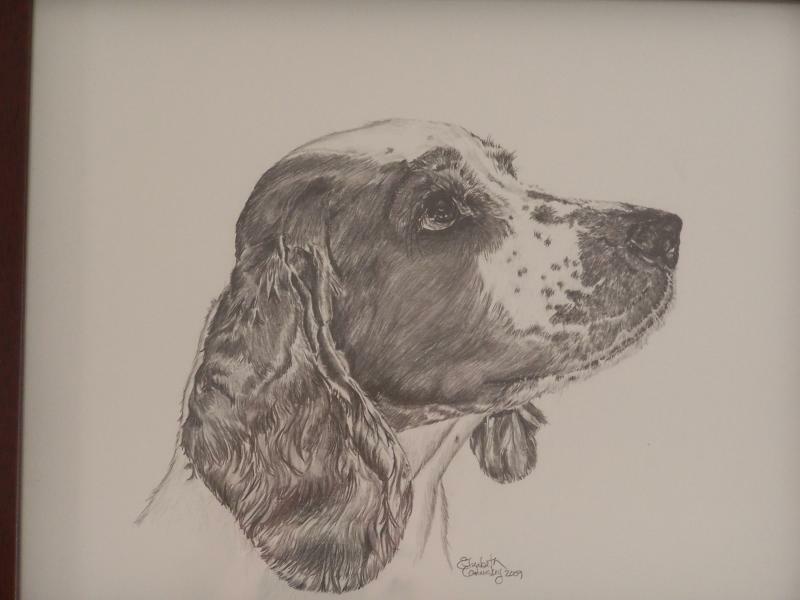 The special gift is a Graphite Pencil Realism drawing of Lexi by the talented artist Elizabeth Commiskey. I had always admiredElizabeth's work but never dreamed Iwould ever be lucky enough to own one. She captured Lexi's expression perfectly and anyone who knows Lexi will certainly agree. Thank you Elizabeth, this treasured possession will hang proudlyover the fireplace in our family room. 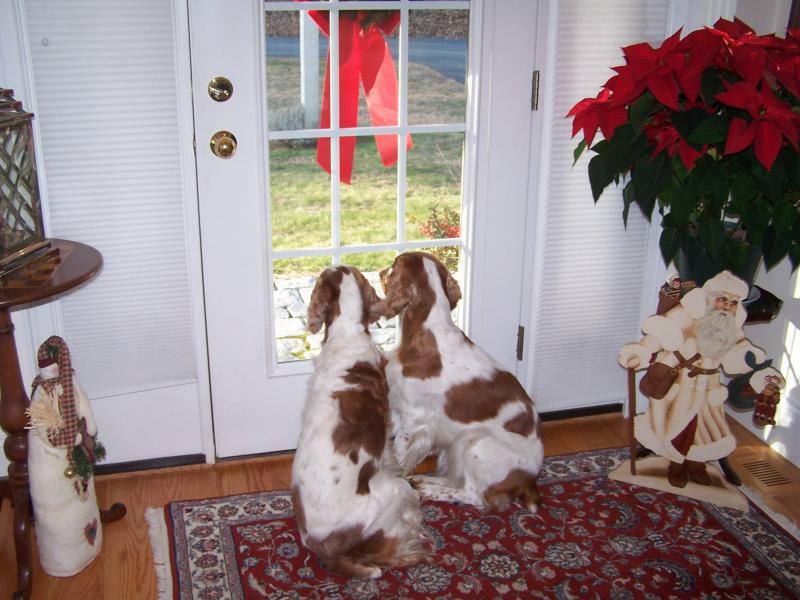 Another beautiful day in Massachusetts and we spent much ofit outside decorating the house for the holidays. 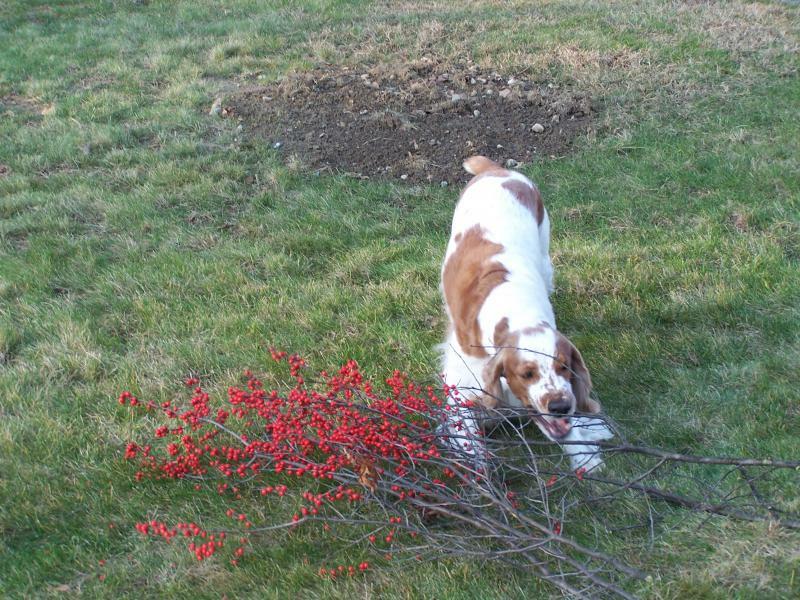 Lexi as always was part of the fun,playingwith thetwigs as I was filling the planters with holly and berries. I sure hope the nice weather continues and the snow stays far away! We are having a wonderfulNovember this year. Today it was 60 degrees and there was no better place to be than in the row boat on the lake. 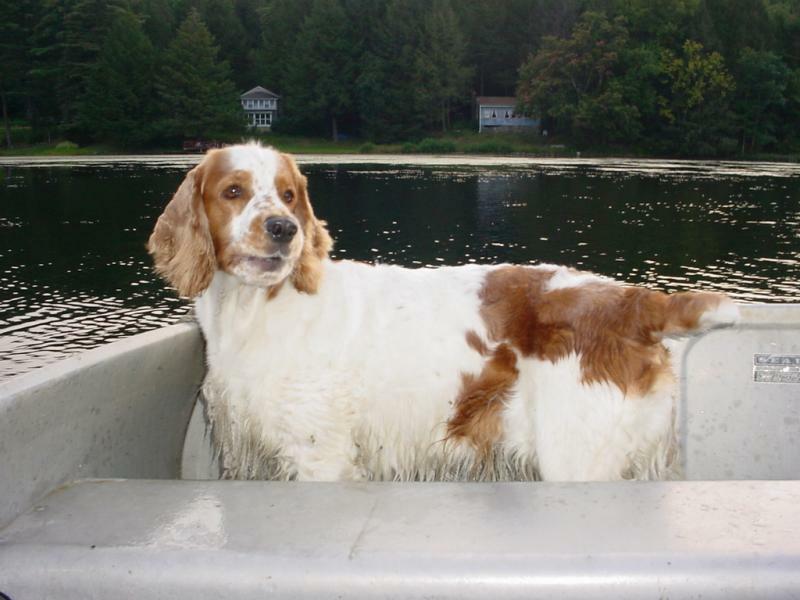 Lexi had a great time in the boat watchingthe fishermen and in the water searching for her own fish. Our friends from Nantucket came to visit us this week. Lexi loved having other people in the house, and was especially pleased to meet each person as they came downstairs in the morning. As you can see from the pictures the feeling was mutual and I had to make sure they didn't try to take Lexi home with them. Just Kidding guys!! 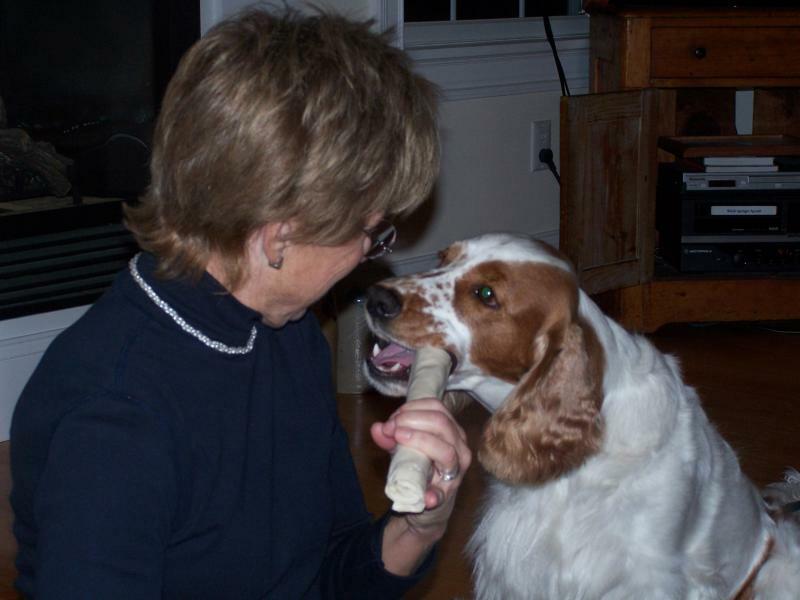 Oh good, someone who will hold my rawhide for me while I chew. Isure like having friends come over who love me. 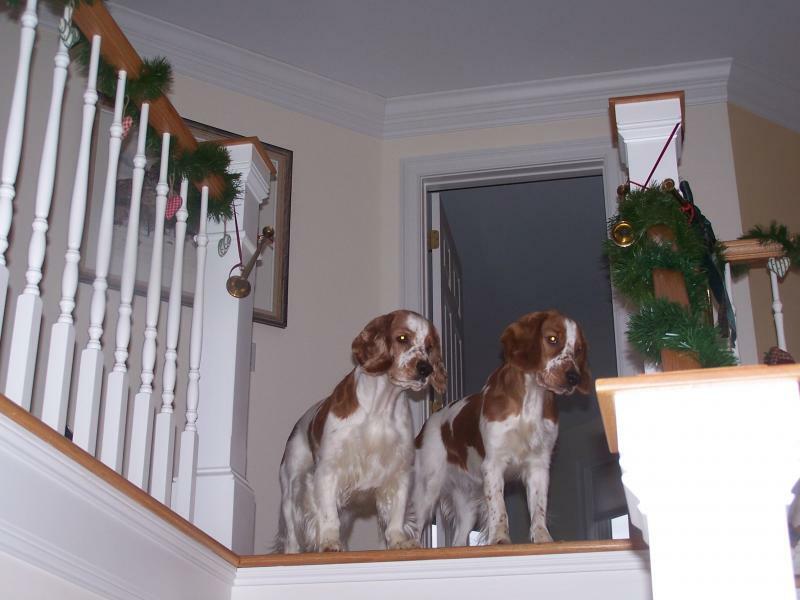 Copyright 2009 Marcia Evans Lexi's Grace Welsh Springer Spaniels All rights reserved.